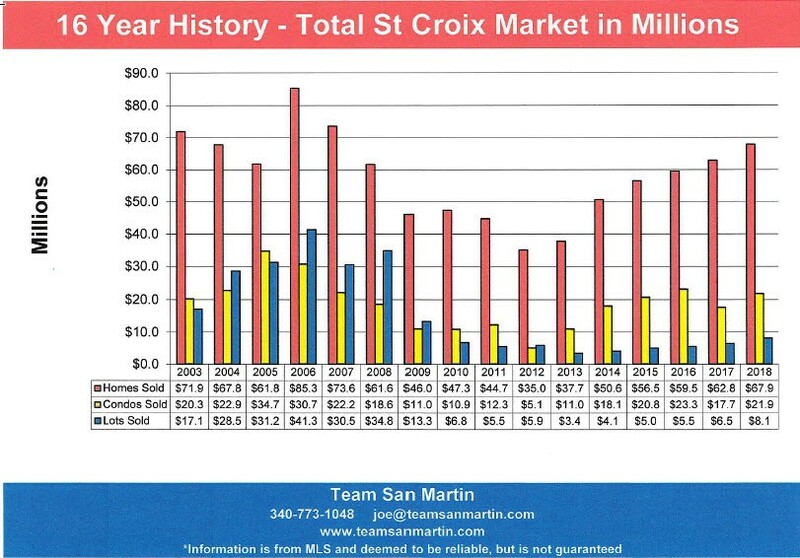 2019 is the 11th year of the St Croix real estate market “recovery” from the real estate boom years of 2006 through 2008. The two Category 5 hurricanes in September 2017 were not helpful. The question is – what do the 1st quarter statistics predict about market prospects for the rest of the year? · Residential inventory peaked in 2012, at 340 homes for sale, and has continually declined each year since. Current residential inventory levels are at only 36% (121 homes) of the 2012 level, a significant decline. · Condominium inventory peaked in 2010, with 265 condominiums on the market. 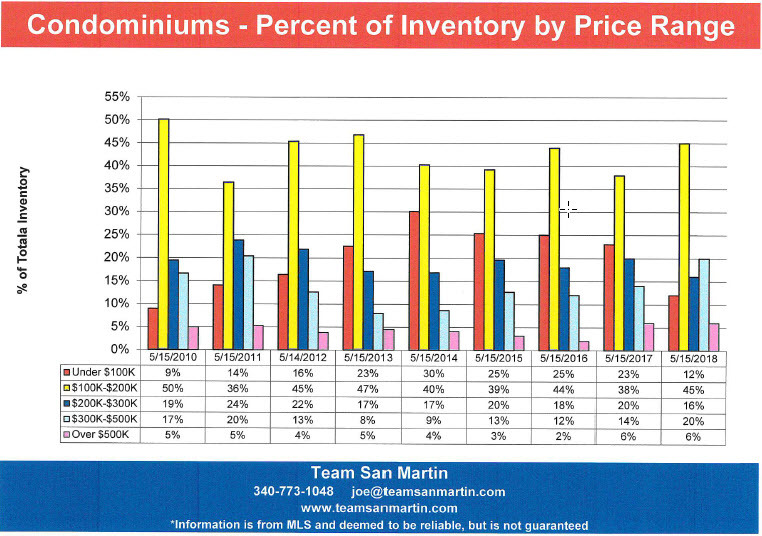 The current level of 46 condominiums for sale is only 17% of the 2010 inventory. · Land inventory also peaked in 2010, at 610 lots for sale. 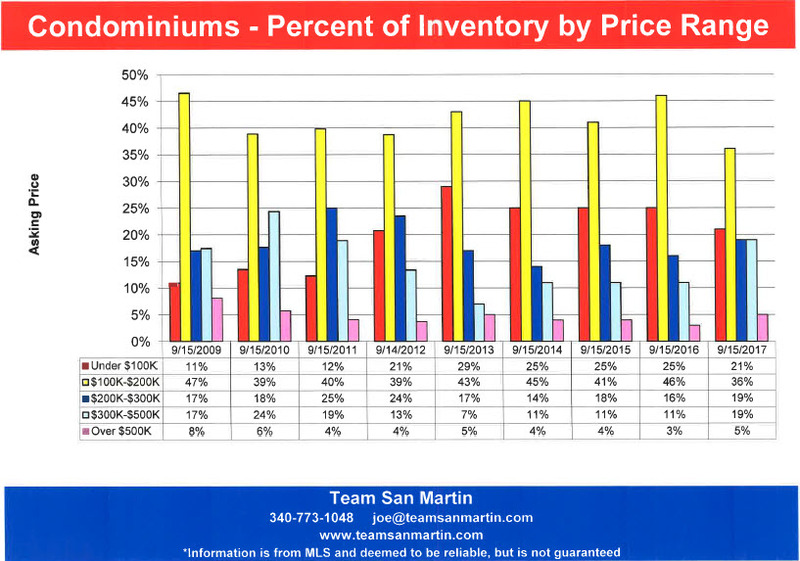 First quarter 2019 inventory is the only segment of the real estate market with increasing inventories, currently at 82% (501 lots) of the 2010 inventory levels. 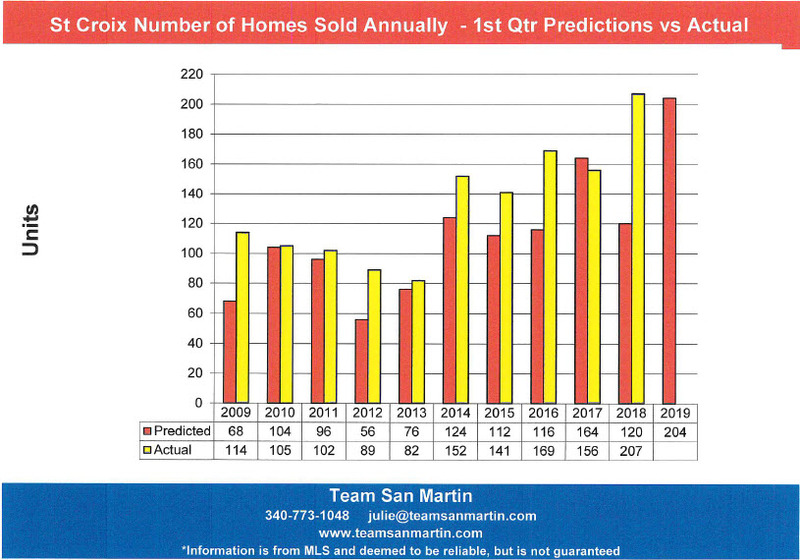 With the exception of 2017 (Irma Maria Hurricanes), the actual number of homes sold annually has exceeded the prediction based on 1st quarter sales. However, it will be difficult to sell 204 homes when there are only 121 homes listed for sale and average days on the market of 10 months. With the exception of 2009 through 2011, the 1st quarter average sales price was a fairly accurate predictor of the annual home sales price. The 2019, 1st quarter average sales price predicts a $100,000 increase in average homes sale price, from $329,272 for 2018 to $429,671 for 2019. · Total number of homes sold will be fewer than predicted, around 120, representing about a 40% decreased from total number of homes sold during 2018. · Average sales price will most likely be in the $400,000 range. This is a much smaller market, with just a few units built since the 1980s. It is more difficult to identify trends, because the sample is significantly smaller. 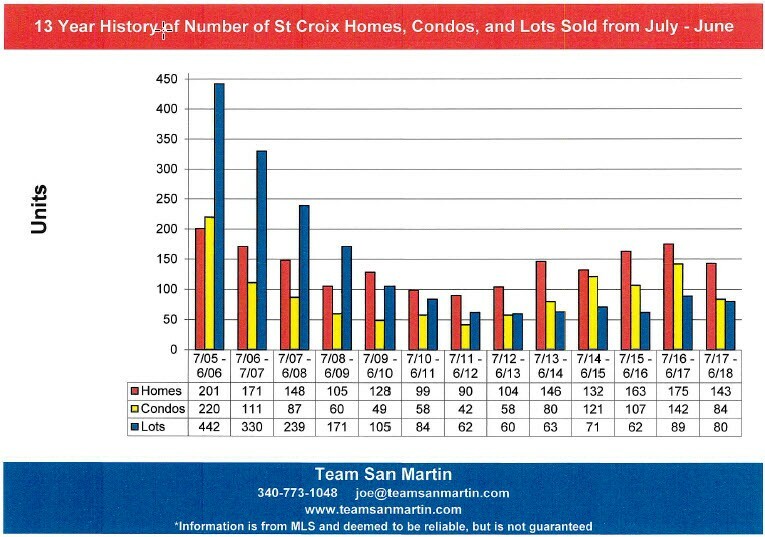 Beginning in 2014, there have been more than 100 condominium sales annually on St Croix. This level of sales will be difficult to sustain, with only 46 condominiums for sale and an average days on the market of 7 months. 1st quarter average sale price has, in most cases, overestimated the average annual condominium sales price. · Total number of condominiums sold will be in the 80 condo range. Put another way, approximately twice as many condos as are currently listed for sale (46) should sell in 2019. · Average sales price will most likely be in the $180,000 range. Both predicted and actual number of lots sold are trending in the right direction, at last! A sign of market recovery! Since 2014, the average lot sales price has consistently been in the $70,000 range. 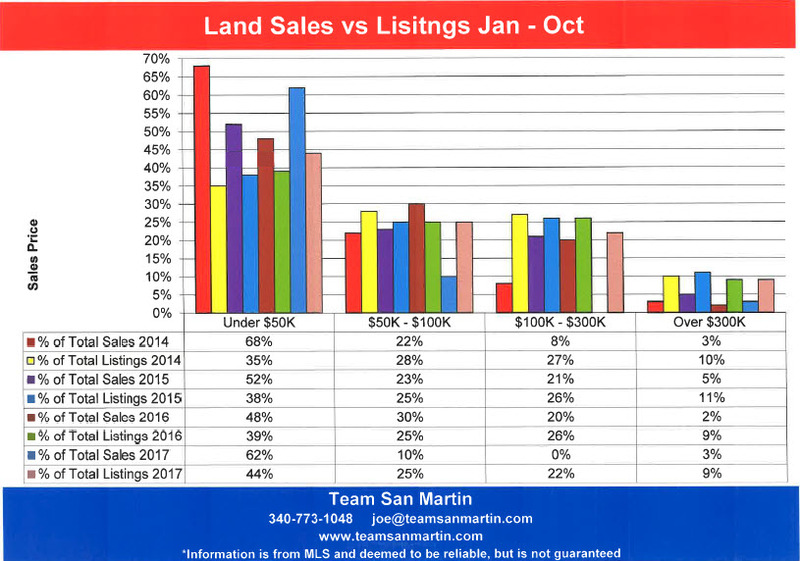 With the exception of 2017 (Irma Maria), predications based on 1st quarter land sales prices for this period have been accurate. · Total number of lots sold will be about 120, similar to 2018. 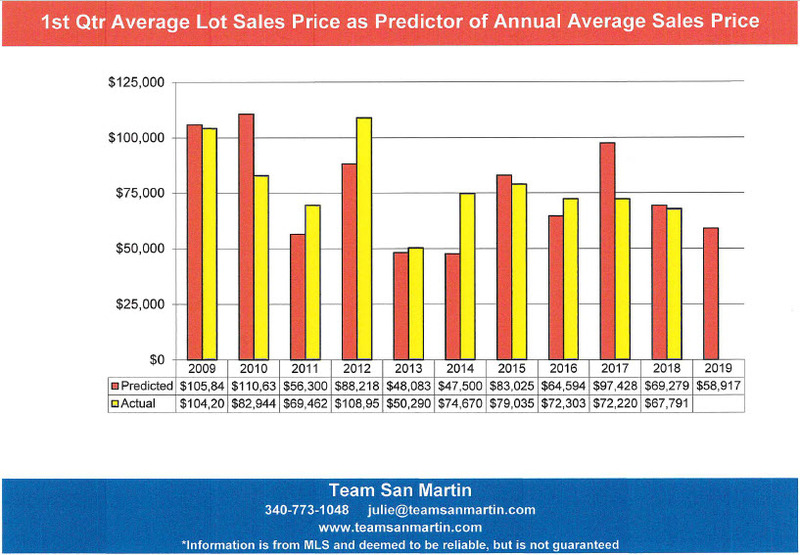 · The 2019 average lot sales price will be in the $70,000 range, similar to the previous 5 years. Information is from MLS and deemed to be reliable, but is not guaranteed. 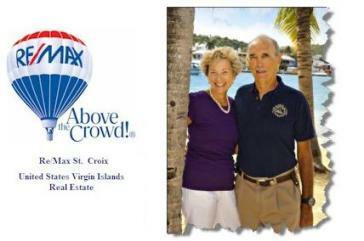 · Over the 16 year period, more homes sold every year on St Croix than on St Thomas. 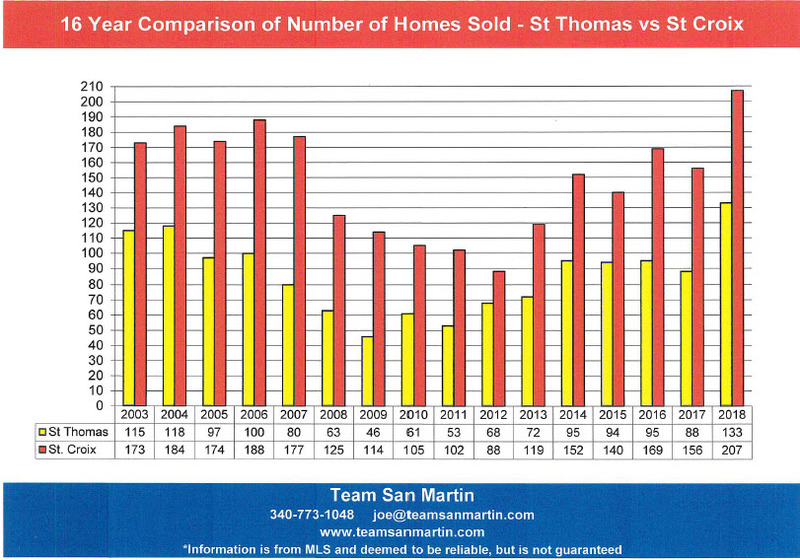 · During 2018, more homes sold on both St Thomas (133) and St Croix (207) than had sold during any of the previous 15 years. · Over the 16 year period, the fewest number of homes sold on St Croix (88) was during 2012, the fewest number of home sold on St Thomas (53) was during 2011. 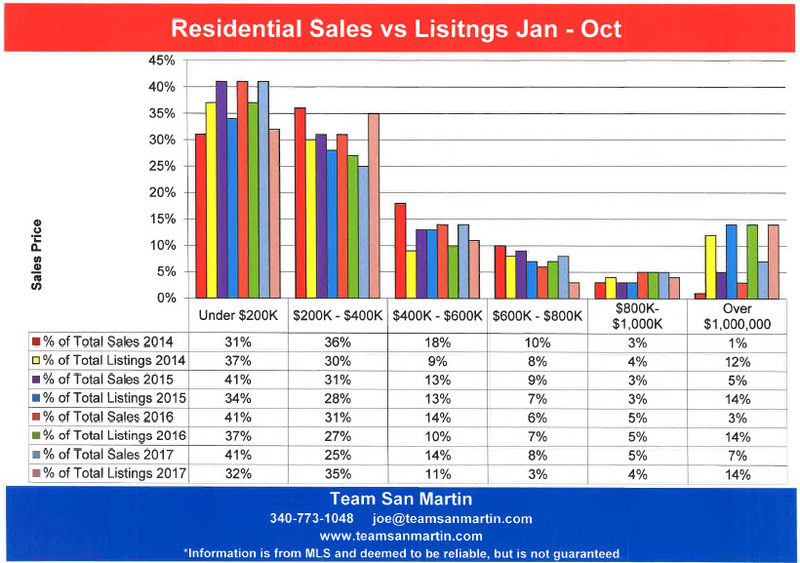 · During 2018, 74 more homes were sold on St Croix, compared to St Thomas. 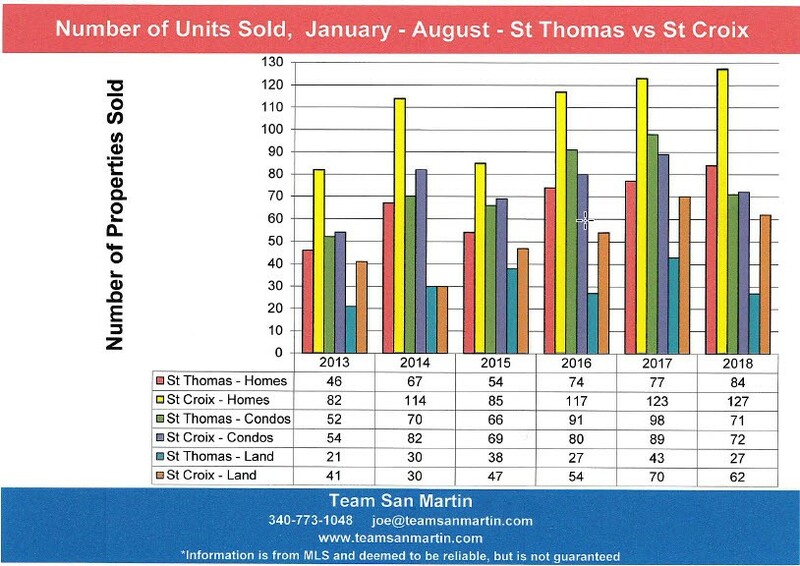 · Compared to 2017, 45 more homes were sold on St Thomas during 2018 and 51 more homes were sold on St Croix during 2018. 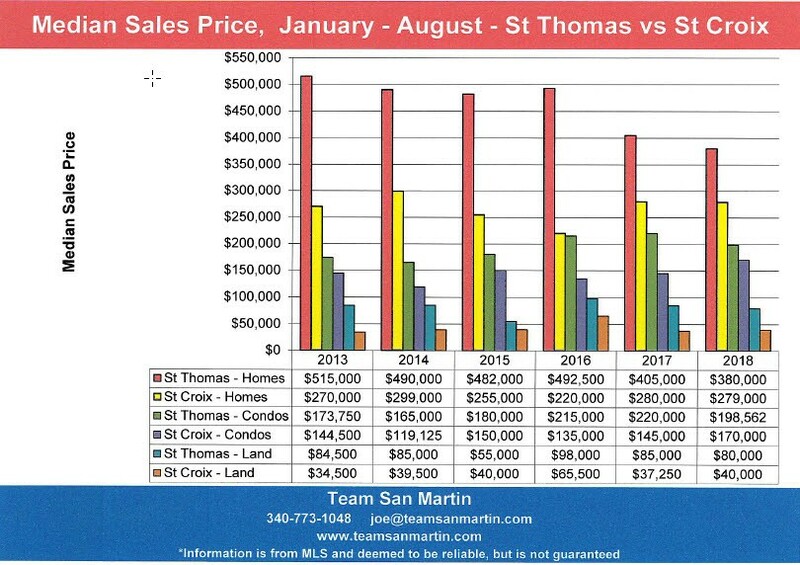 · At the beginning of this 16 year period (2003), average sales prices for St Thomas and St Croix were nearly identical, at an average of $415,823. 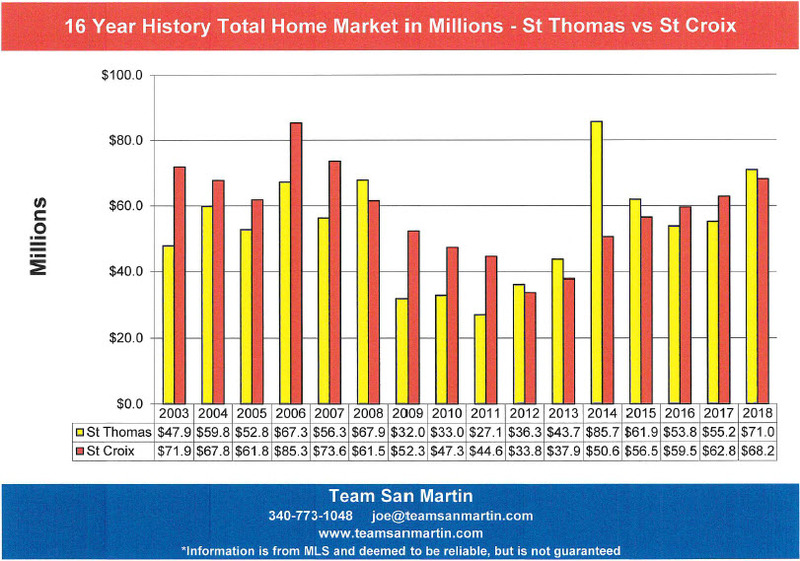 · For the past 15 years (since 2004), the annual average home sales price on St Thomas has exceeded that of St Croix. · For 2018, the average St Thomas homes price was 28% higher, at $533,800, than the 2003 average sales price. 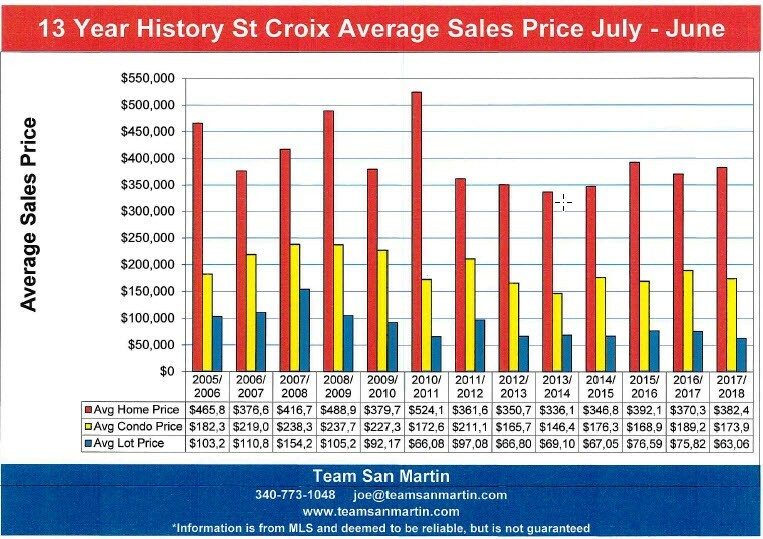 The average annual home sales price on St Croix for 2018 was 21% lower, at $329,272, than the 2003 average sales price. · For 2018, the average sale price of a home on St Croix ($329,272) was 62% of the averages sales price of a home on St Thomas ($533,800). 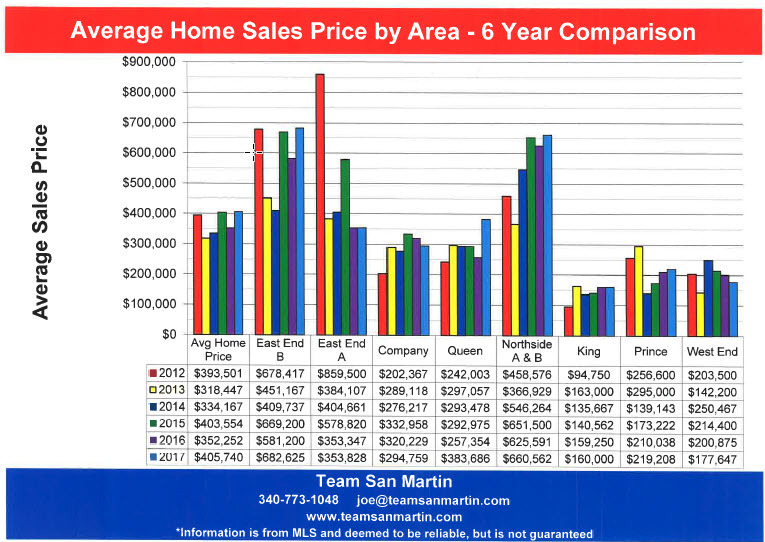 · This measurement is a combination of total homes sold multiplied by average sales price; it gives the best overview of annual market performance. 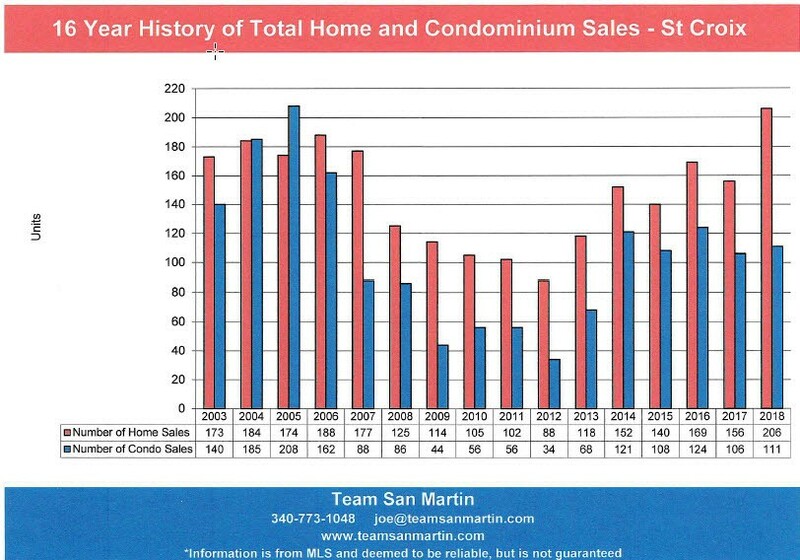 · During this 16 year period, the total St Thomas residential market exceeded the total St Croix market during six years: 2008, 2012, 2013, 2014, 2015, and 2018. 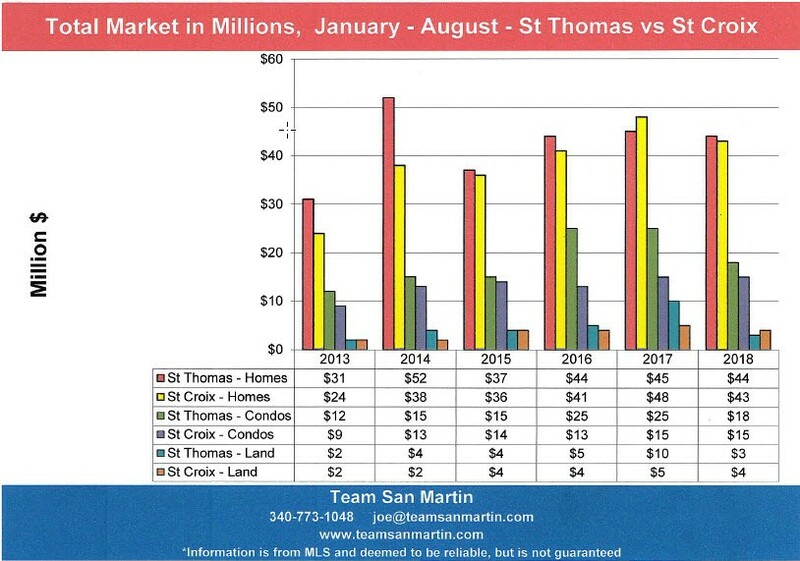 · During 2018, the total St Thomas residential market exceeded the total St Croix residential market by about $3 Million. 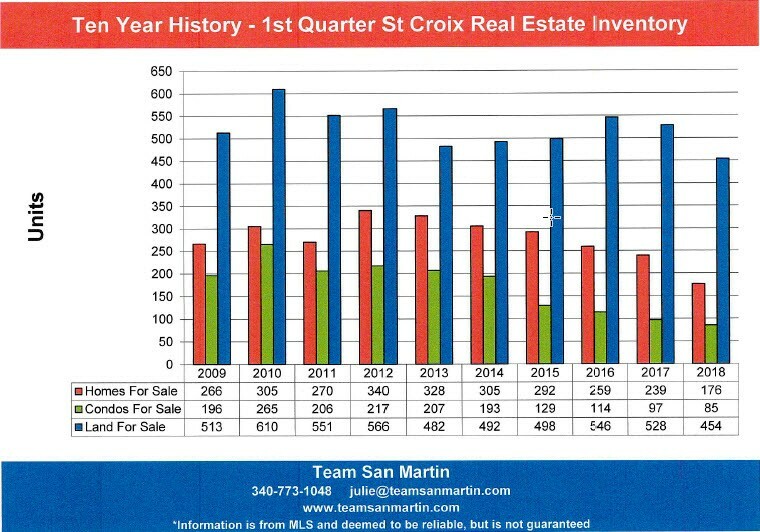 · More homes sold on St Croix during 2018 than were sold during any of the previous 15 years! The next highest number of homes sold was 188 during 2006, the height of the real estate boom. 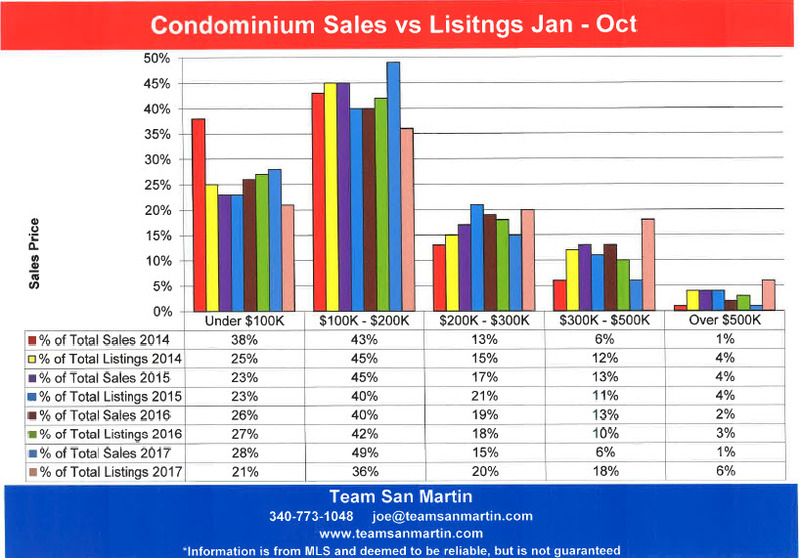 · During 2018, 111 condominiums sold on St Croix, very similar numbers to the previous 4 years. Nearly twice as many condos sold during 2005 (208 condos). The fewest condos sold in 2012, when only 34 condominiums sold. 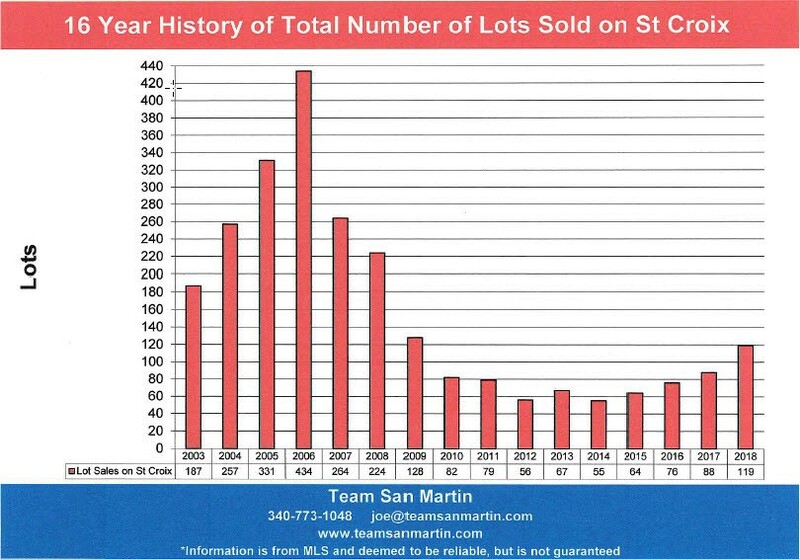 · There were 119 lots sales in 2018, the highest number of lots sold on St Croix since 2009. · The average 2018 home sales price ($329,559) was $83,880 lower than the 2003 average home sales price of $413,439. The only lower average home sales price during the 16 year period was in 2013 ($319,459). · The 2018 average condominium sales price ($196,971) is $52,148 higher than the average condo price in 2003 ($144,823). The 2018 average condo sale price is similar to the average condominium sales price for the previous three years. · The average 2018 lot sales price ($68,045) is $23,270 lower than the average lot sale price for 2003 ($91,315). Over the 16 year period, only 2013 saw a lower average lot sales price ($50,290). · The 2018 total residential market ($67.9 million) was about $5 million higher than the 2017 total residential market ($62.8 million) and about $4 million lower than the total 2003 residential market ($71.9 million). · The 2018 total condominium market ($21.9 million) was $4.2 million higher than the total 2017 condominium market ($17.7 million) and $1.6 million higher than the total 2003 condo market of $20.3 million. · The 2018 total land market ($8.1 million) exceed the previous year by $1.6 million. But the total land market is still $9 million below our total land market of 16 years ago ($17.1 million) and $33.2 million below the height of the market during this 16 year period (2006 with a total land market of $41.3 million). 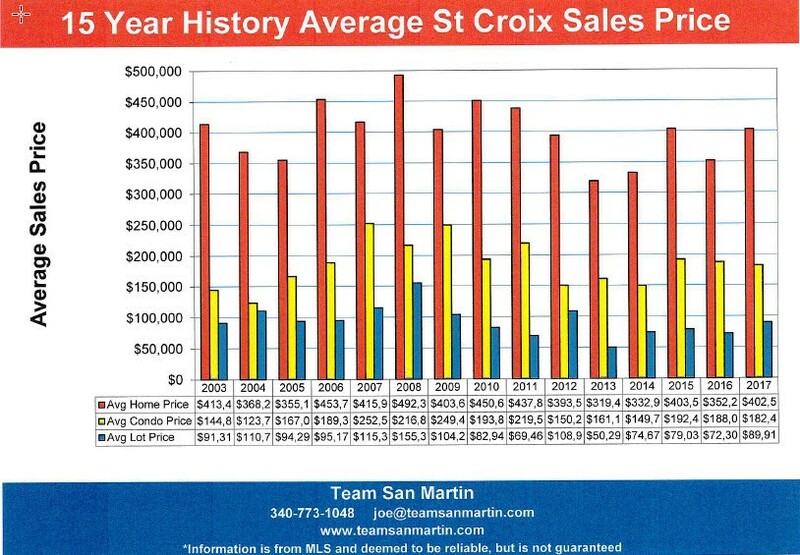 The average sales price of a home on St Croix decreased by $63,061 over the 7 year period; this is a 16% decrease. Total number of homes sold increased 130% (116 homes) since 2012. All areas of the island did not perform the same. Compared to 7 years ago, the average sales price of a home decreased 31% ($210,979). 12 homes sold in 2012, 16 homes sold in 2018. Compared to 7 years ago, the average sales price of a home decreased 50% ($432,185) from $859,500 for 2012 to $427,315 for 2018. Nearly 5 times as many homes sold in 2018 (48) compared to 7 years ago, when 10 homes sold. Compared to 7 years ago, the average sales price of a home increased 59% ($119,518), from $202,367 for 2012 to $321,885 for 2018.
from 15 home sales in 2012 to 24 home sales in 2018. Compared to 7 years ago, the average sales price of a home increased 13% ($31,995) from $242,003 for 2012 to $273,998 for 2018. The number of homes sold in a year has doubled since 2012, from 22 homes sold in 2012 to 45 home sales in 2018. Compared to 7 years ago, the average sales price of a home increased 22% ($101,794), from $458,576 for 2012 to $560,370 for 2018. The number of homes sold in a year is unchanged from 2012; 13 homes sales closed in both 2012 and 2018. Compared to 7 years ago, the average sales price of a home increased 44% ($41,506), from $94,750 for 2012 to $136,256 for 2018. More than 4 times as many homes closed in 2018 (9 home sales), compared to 2012 (2 home sales). Compared to 7 years ago, the average sales price of a home decreased 13% ($33,100), from $256,000 for 2012 to $223,500 for 2018. Compared to 7 years ago, the average sales price of a home increased 15% ($30,563), from $203,500 for 2012 to $234,063 for 2018. More homes sold in all quarters during 20187, when compared to 2012, except for Northside A & B, where the same number of homes sold as did 7 years ago (13). Compared to 2017, the island wide average home sale price decreased 16%. 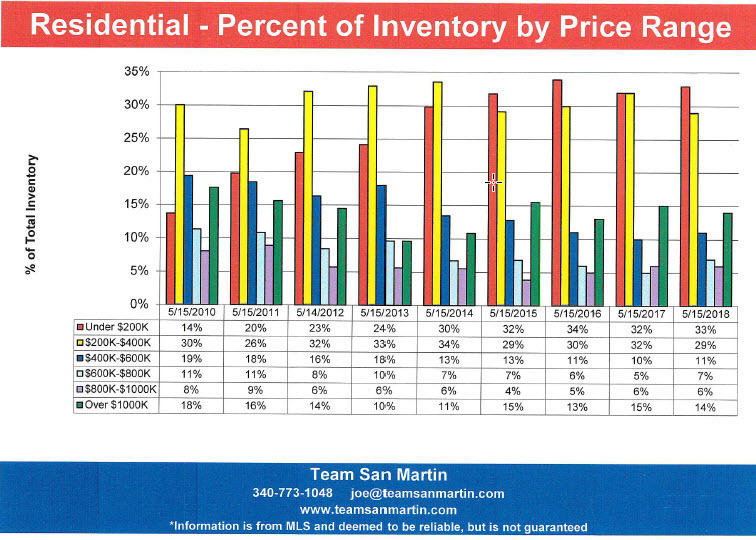 Current Annual supply represents the number of years it will take at the current rate of sales to sell all the properties listed in a specific area (Quarter) of St Croix. 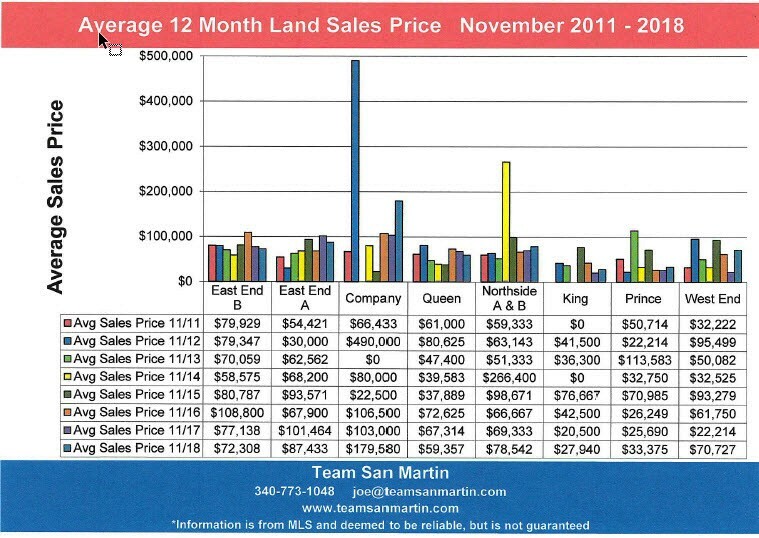 7 years ago, no land sales were reported in King Quarter during the 12 month period ending November 2011.
average condominium sales price is unchanged at $153,375. 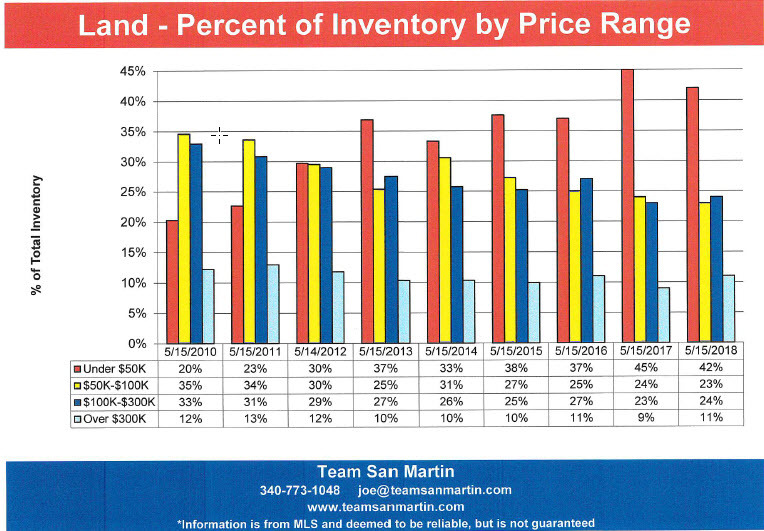 Which St Croix Price Ranges are Selling? 49% lower (129 homes) than ten years ago. GIGANTIC decrease over the ten year period! 23% lower (135 lots) than ten years ago. Under $200,000 listings have more than doubled (from 13% to 31%) as percentage of total inventory, compared to ten years ago. $200,000 to $400,000 listings decreased by 5%, from 29% of inventory ten years ago to currently 24% of total inventory. $400,000 to $600 listings have remained constant at about 15% of total inventory over the ten year period. $600,000 to $800,000 listings have declined from 15% of total inventory to just 6% over the ten year period. $800,000 to $1,000,000 listings remain unchanged over the ten year period at about 8% of total inventory. Listings over $1,000,000 also have remained unchanged at about 19% of total inventory, with a decline to just 11% of total inventory in 2011. Under $100,000 listings are again 11% of total condo listings, as they were ten years ago. In 2013, this price range accounted for 29% of all condo listings. $100,000 to $200,000 listings have decreased by 8% of total inventory, to about 39%, compared to ten years ago (47%). $200,000 to $300,000 listings have increased by 4% as percentage of total inventory, at about 21%, compared to ten years ago (7%). $300,000 to $500,000 listings have also increased by about 3%, from 17% to 20%, compared to ten years ago. Listings over $500,000 again represent about 9% of the total condominium market, as they did ten years ago. In 2016, this segment of the market was only 3% of total condominium market. Under $50,000 listings have nearly doubled (from 21% to 40%) as percentage of total inventory, compared to ten years ago. $50,000 to $100,000 listings have decreased by 5% as percentage of total inventory, from 30% to 25%, compared to ten years ago. $100,000 to $300,000 listings have decreased by 7%, from 33% to 26%, compared to ten years ago. Listings over $300,000 have decreased by 6% of the total inventory over the ten year period, from 16% on 9/15/09 to 10% on 9/15/18. Residential sales after the storm were robust. St Croix showed a slight increase in number of sales. 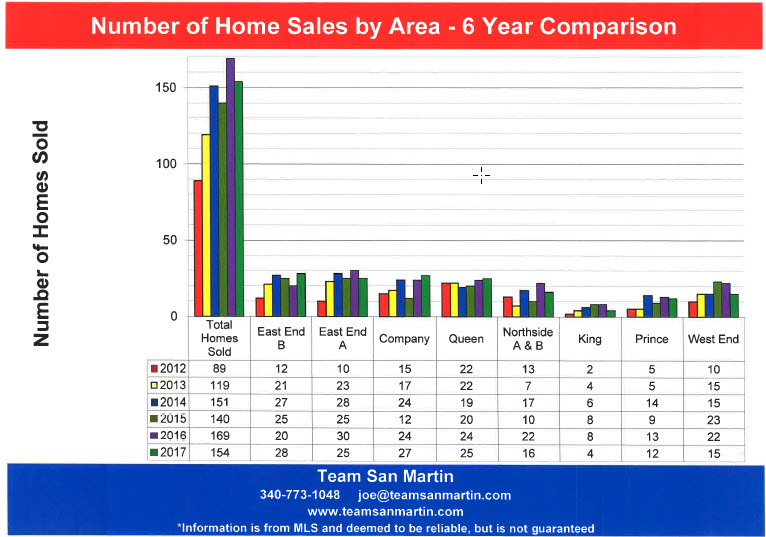 St Thomas sales were nearly twice as numerous, compared to six years ago. Condominium sales were more affected by Irma Maria than residential sales. Compared to six years ago, condominium sales on both islands increased significantly. Vacant land sales declined significantly on St Thomas after the storms, St Croix land sales fared better. Both islands experienced a decline in average sales price after the storms. Not unexpected, given the damage sustained. Median sales price is the midpoint - half of all homes sold for more than this price, half sold for less. 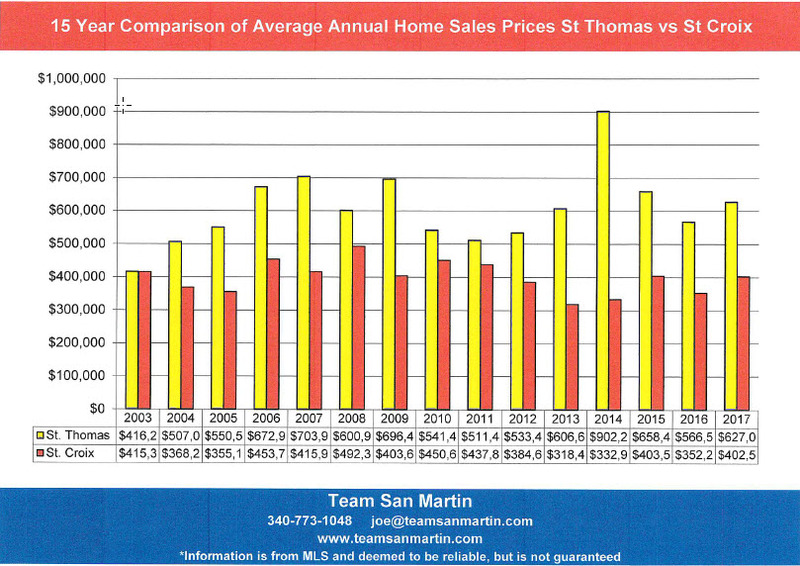 For St Thomas, the median sales price consistently decreased over the 6 year period. On St Croix, the median sales price remained at $280,000 for the last two years, after decreasing to just $220,000 for this period in 2016. 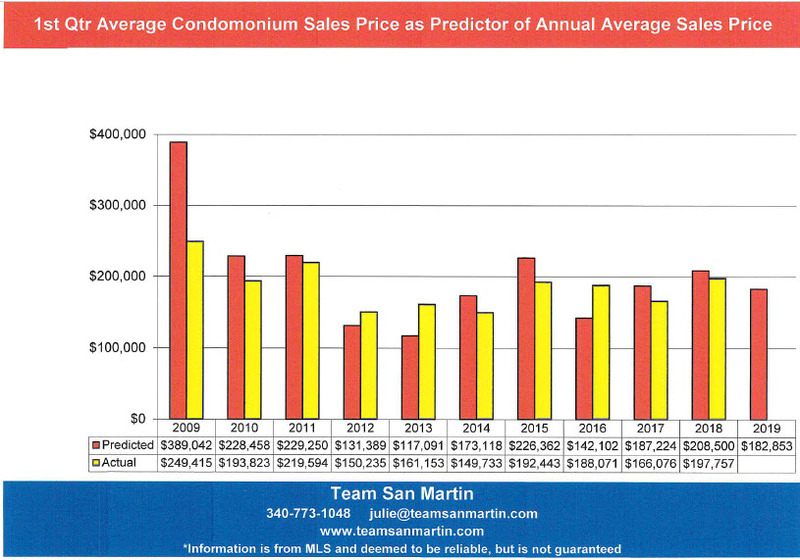 Over the six year period, the median condominium sales price on both St Thomas and St Croix increased about $25,000. 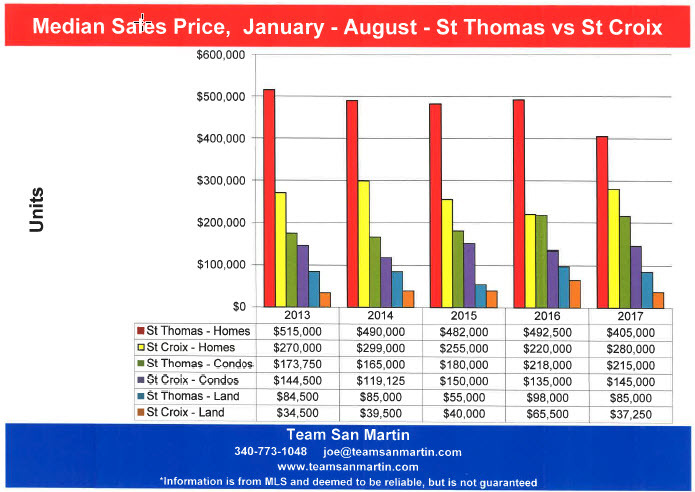 The average St Thomas land sales price is about the same as it was six years ago. 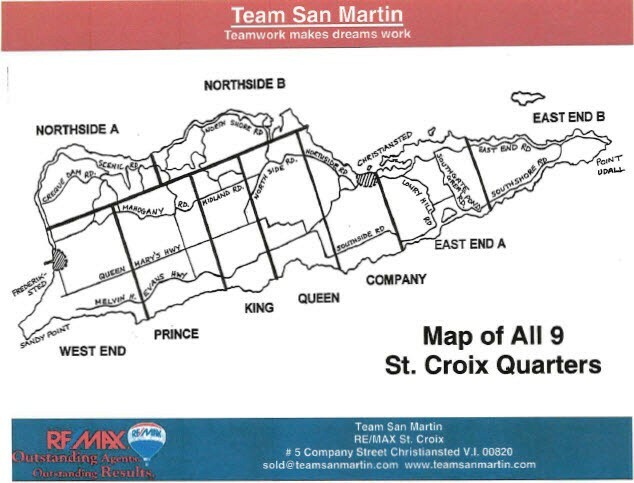 On St Croix, average land sale price increased by about $25,000. 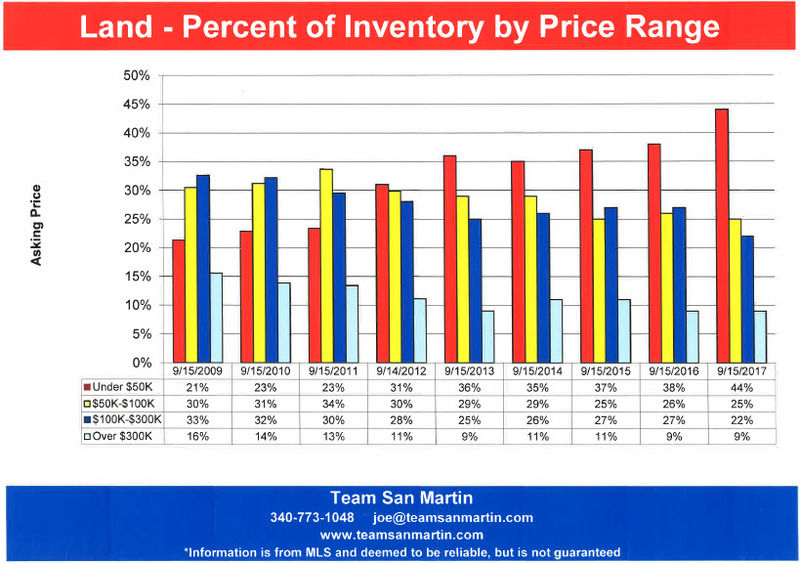 On both islands, the median lot sales price is nearly the same as 6 years ago. 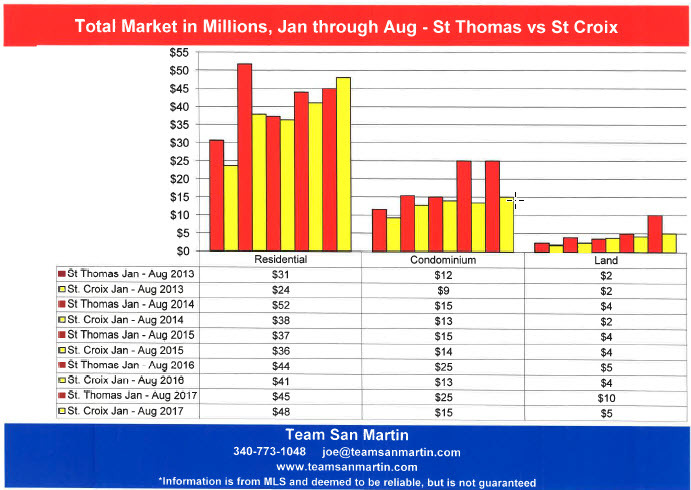 The 2018 St Thomas and St Croix total residential markets were nearly the same. The St Thomas total condominium market declined by seven million dollars between 2017 and 2018. 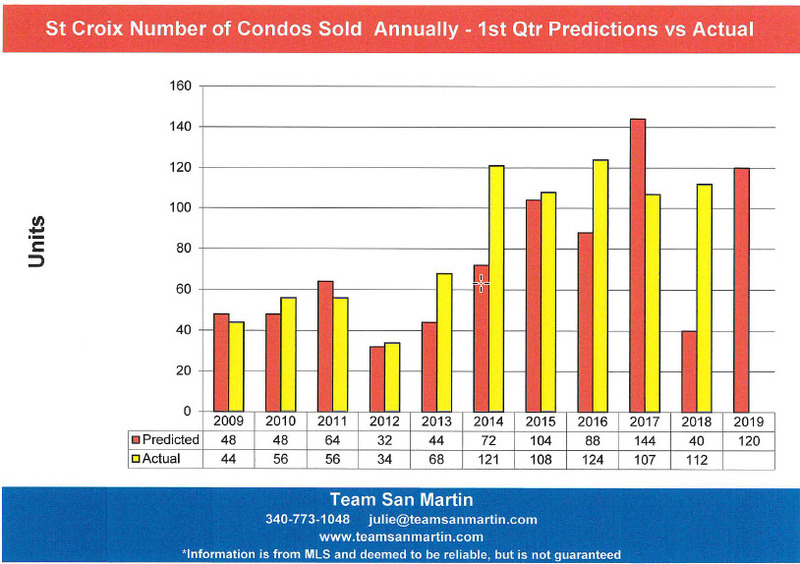 On St Croix there was no change in total condo market for this period. 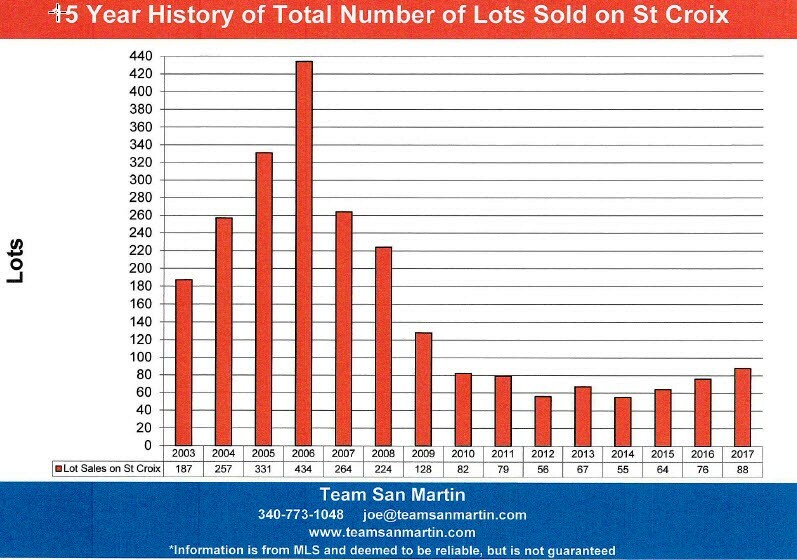 The St Thomas 2017 total land market was skewed by one large sale. 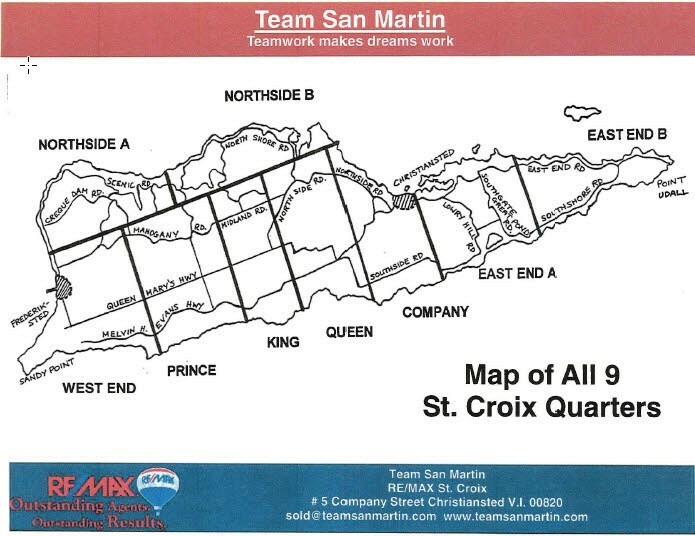 For the first 8 months of 2018, the St Croix total land market exceeded that of St Thomas by $1 Million. Six years ago (July 2012), there was a 4.7 year supply of homes and a 4.3 year supply of condominiums on the market. There is now a 19 month supply of homes and an 11 month supply of condominiums in this quarter. Compared to six years ago, both homes and condominiums have experienced a decrease in average sales price. The average sales price of a home in this quarter ($560,938) is $15,000 less than it was six year ago ($575,667). Condominiums experienced a larger decrease in average sales price ($152,000), from $383,500 for the 12 months ending July 2012 to $230,538 for the 12 months ending July 2018. Six years ago (July 2012), there was a 4.2 year supply of homes and a 4.8 year supply of condominiums on the market. Inventory has decreased for both homes and condominiums. 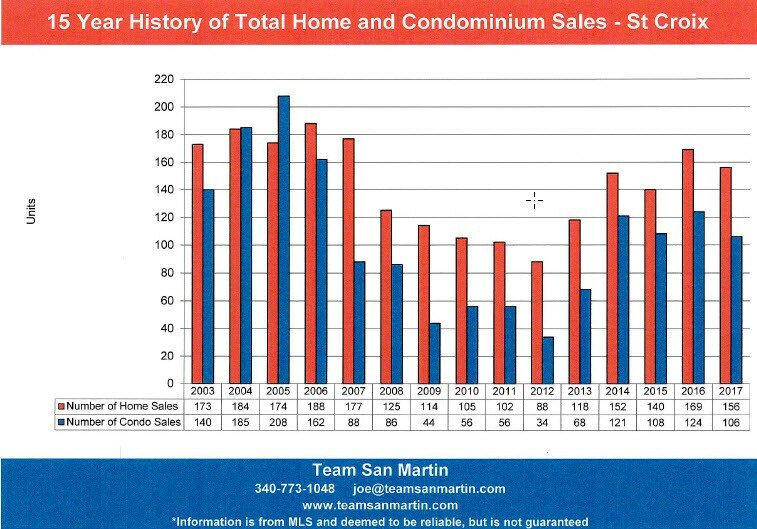 There is now an 18 month supply of homes and a 10 month supply of condominiums in this quarter. Average residential sale price ($458,335) decreased about $22,000, compared to six years ago. Condominium average sale price ($245,190) increased by about $40,000, when compared to six years ago ($204,667). Six years ago (July 2012), there was a 3.7 year supply of homes and a 5.9 year supply of condominiums on the market. Residential inventory decreased by more than 2 years, to a 17 month supply of homes. Condominium inventory sell off was dramatic, from a 5.9 year supply of units six years ago to a current 1 year supply of condominiums for sale. Homes and condominiums both experienced average sales price increases, compared to six years ago. Average home sale price increased the most ($72,000), from $191,269 in 2012 to $264,498 for the 12 months ending July 2018. 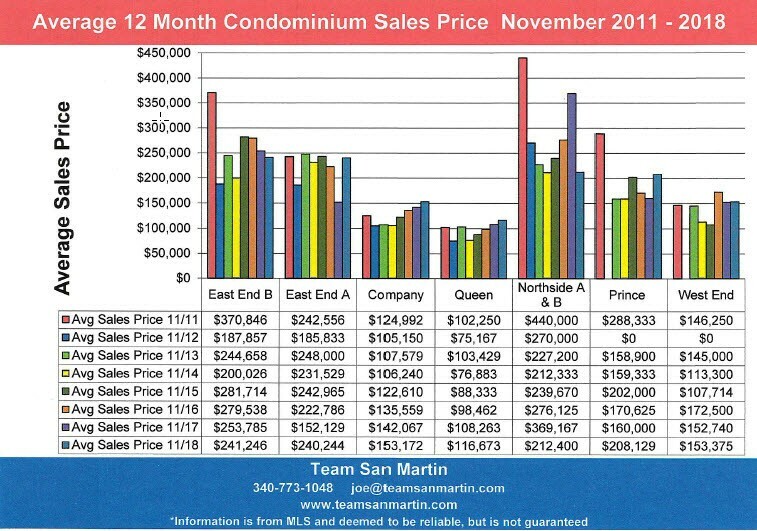 Average condo sale price increased $37,000, from $$101,250 six years ago to $143,896 for the 12 months ending July 2018. 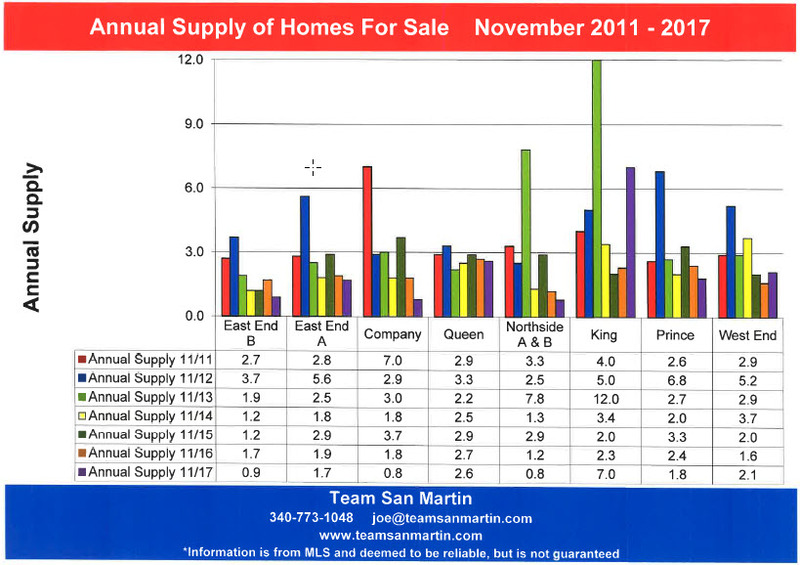 Six years ago (July 2012), there was a 3.1 year supply of homes and an 8.3 year supply of condominiums on the market. Home inventory has decreased by 16 months, to 1.8 years, over the six year period. Condominium inventory decreased by more than 7 years over this period, to an 8 month supply for the 12 months ending July 2018. Decrease in inventory levels also resulted in an increase of average sale price over the six year period, for both homes and condos. Average residential sale price increased by $37,000 over the six year period, from $291, 29 in 2012 to $328,725 from the 12 months ending July 2018. $75,125 in 2012 to $119,408 from the 12 months ending July 2018. Six years ago (July 2012), there was a 4.6 year supply of homes and a 6.5 year supply of condominiums on the market. Residential inventory decreased by 3 years, to a 1.5 year supply of homes. The condominium supply decreased by nearly 4 years, to a 2.7 year supply of condominiums in this quarter. Average home sale price ($549,333) increased by $90,000, compared to six years ago ($459,110). 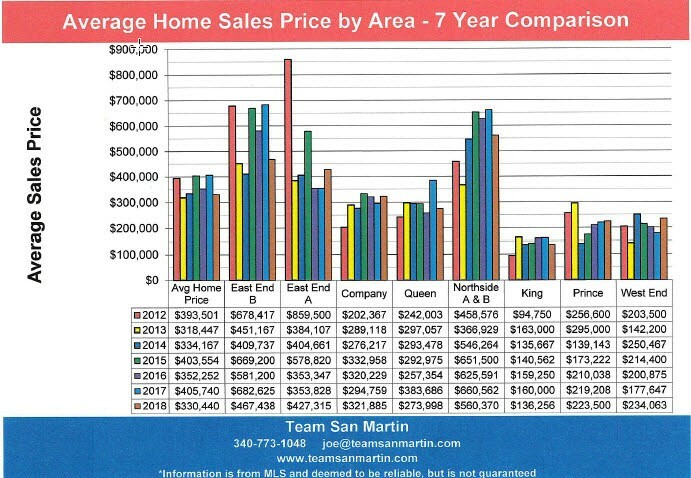 Current average sale price is, however, $210, 00 lower than the highest average sale price during the six year period, which was $753,188 for the 12 months ending July 2016. Average condominium sale price decreased by about $30,000 over the six year period, from $345,000 for the 12 months ending July 2012 to $316,500 for the 12 months ending July 2018. Located near the closed refinery, this is the worst performing segment of our market. there are no condominiums in King Quarter. Residential inventory increased slightly, to a 4 year supply of homes, compared to six years ago. 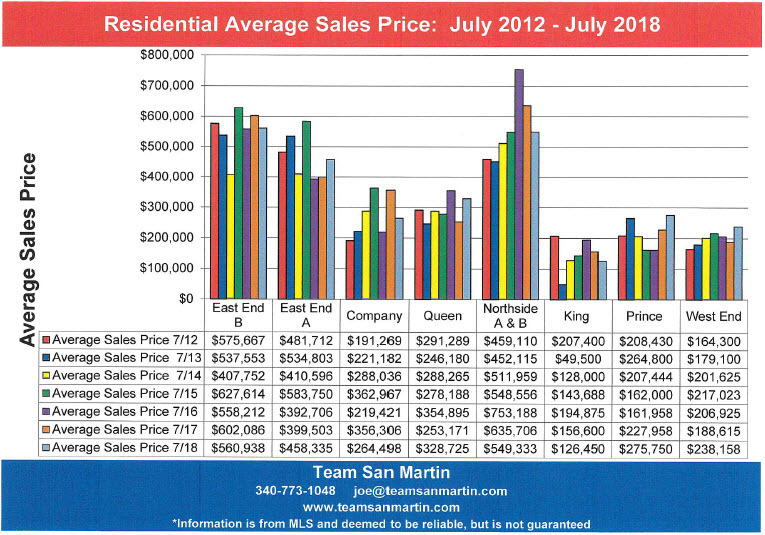 For the 12 months ending July 2013, only one home sold in King Quarter. Average home sale price decreased $81,000 over the six year period, from $207,400 for the 12 months ending July 2012 to $126,450 for the 12 months ending July 2018. Six years ago (July 2012), there was a 5.8 year supply of homes and an 11.0 year supply of condominiums on the market. Residential inventory decreased by 2 years, to a 3.7 year supply of homes. Condominium inventory decreased by nearly 11 years, to a 1.3 year supply of condominiums. Homes saw a sale price increase of nearly $70,000 when compared the six years ago, from $208,430 for the 12 months ending July 2012 to $275,750 for the 12 months ending July 2018. Condominiums experienced a $214,000 decrease in average sale price over the six year period, from $415,000 for the 12 months ending July 2012 to $200,625 for the 12 months ending July 2018. Six years ago (July 2012), there was a 4.6 year supply of homes and a 7.0 year supply of condominiums on the market. Over the six year period, residential inventory decreased by 3.4 years, to a 1.2 year supply of homes for the 12 months ending July 2018. Condominium inventory decreased by 5 years, to a 2 year supply of condominiums. Average home sale price increased $74,000 over the six year period, from $164,300 for the 12 months ending July 2012 to $238,158 for the 12 months ending July 2018. Average condominium sale price increased $45,000 over the six year period, from $62,500 for the 12 months ending July 2012 to $107,067 for the 12 months ending July 2018. Residential and condominium inventories decreased island wide over the past seven years, with the exception of King Quarter, where residential inventory increased about 2 months. · Residential – Fewer homes sold in the past 12 months than were sold during the past 4 annual cycles. But there was that weather event - Irma / Maria, the likes of which we have not seen for 100 years! · Condominiums – 40% fewer (84) condominiums sold than were sold during the previous 12 month period (142). · Residential – The one bright spot! The “average” sales price of a home on St Croix ($382,435) increased by $12,000 over the previous 12 month period ($370,340). 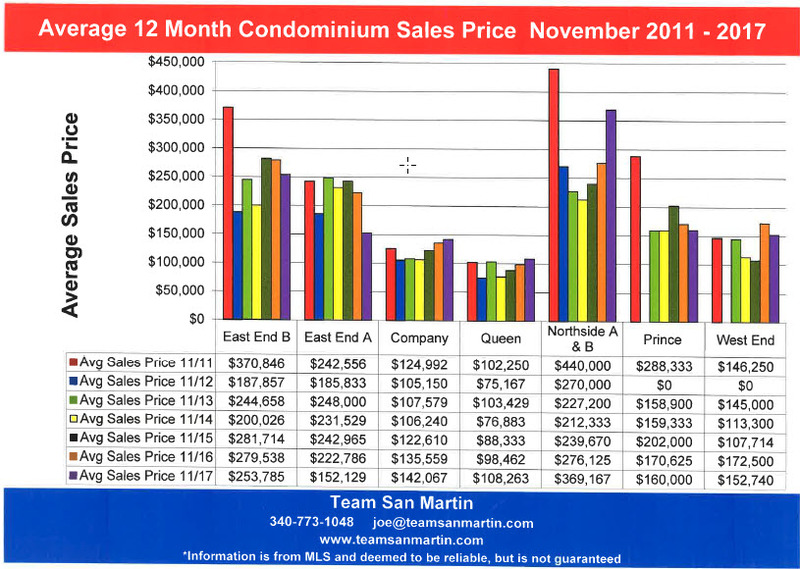 · Condominiums – Average condominium sales price for this 12 month period ($173,977) was about $15,000 less than the previous period ($189,240). · Land – Average lot sales price ($63,069) also decreased, by about $11,000, for this 12 month period, when compared to the previous period ($75,822). · Residential – The total residential market ($54.7 million) was $10 million less than the previous 12 month period (($64.8 million). 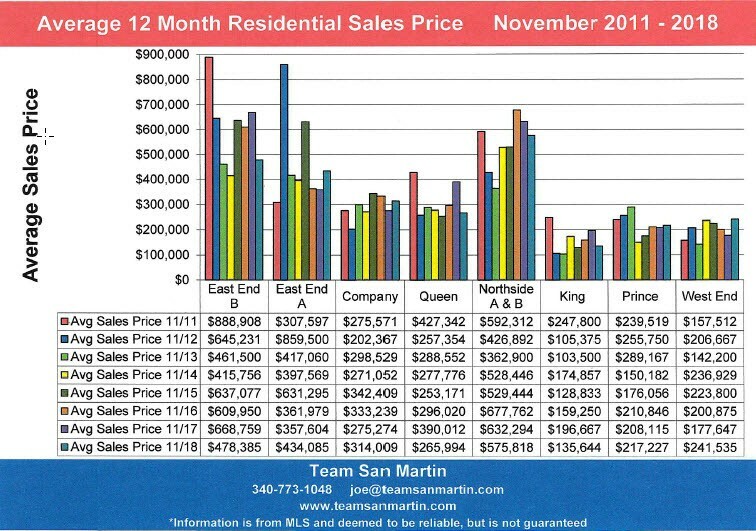 · Condominiums – This 12 month period ($14.6 million) was $12 million less than the previous 12 months ($26.9). Many fewer condominiums sold, at a lower average sale price. · Land – This total market experienced the smallest decrease ($1.7 million). The total market for July 2017 through June 2018 was $5 million. For the previous 12 month period, the total land market was $6.7 million. 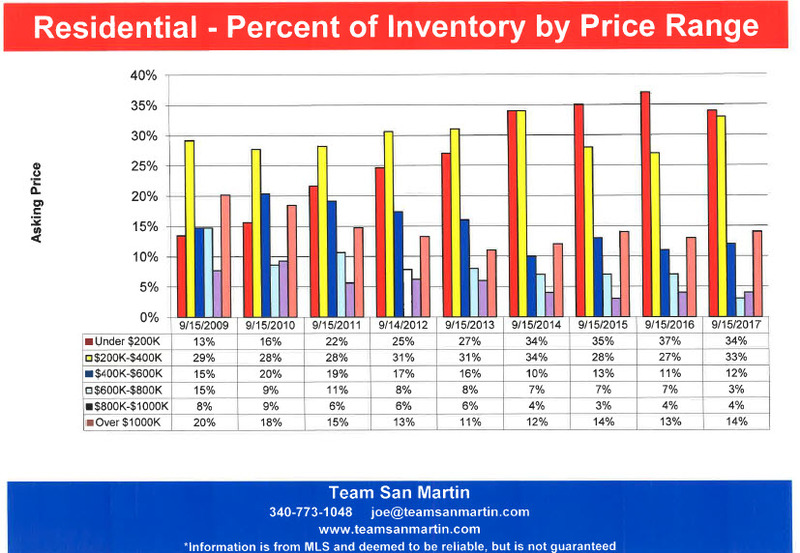 Inventory levels by price range reflect the seller’s expectations. 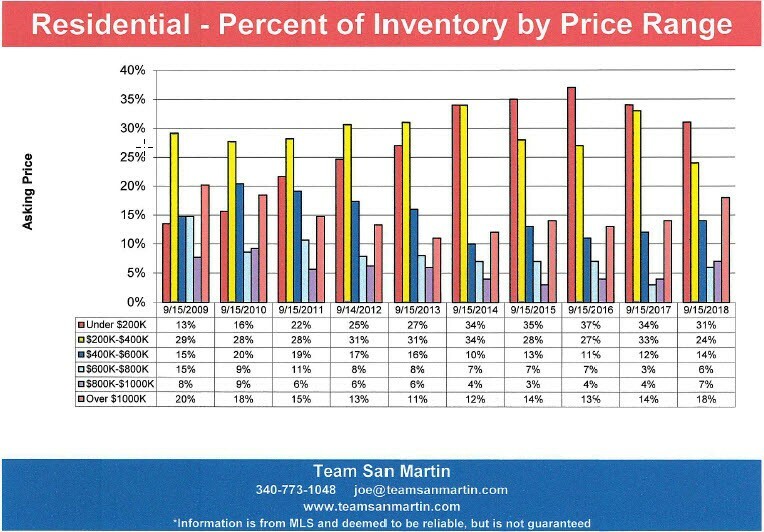 The attached graphs compare changes in asking prices over the past nine years, using 15 May inventory levels. 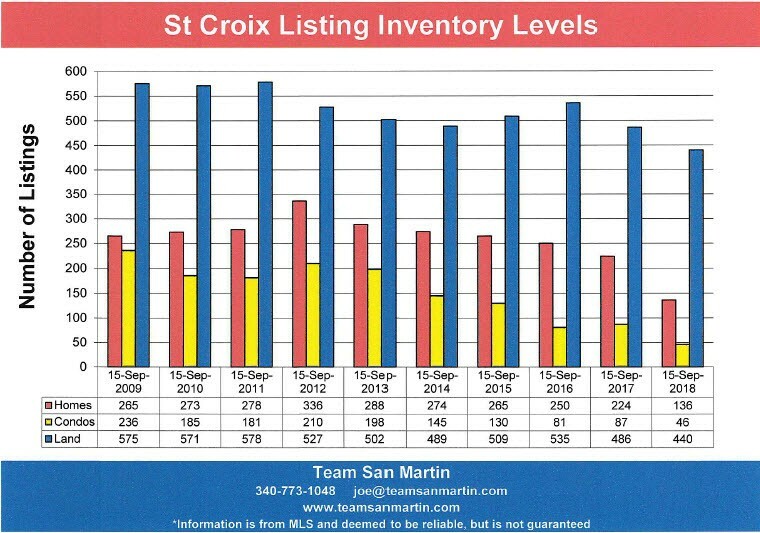 · The lowest price range (under $200,000) has accounted for about one third of the St Croix residential inventory for the past 5 years. In 2010, this price range was only 14% of the inventory, increasing to about 25% for the next three years. 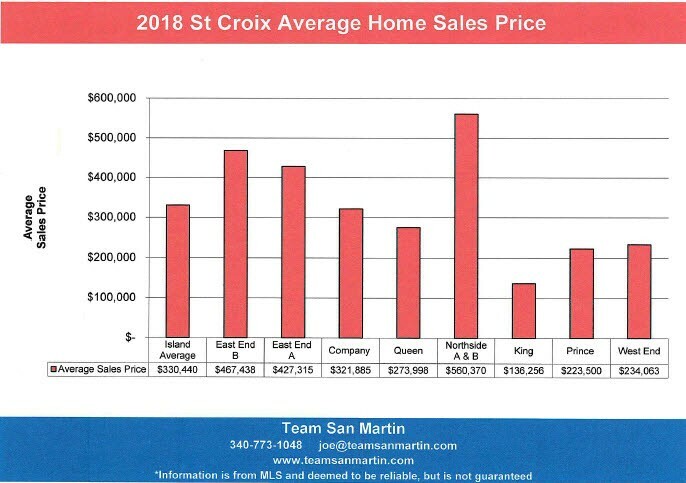 · The second tier ($200,000 to $400,000) has consistently comprised nearly one third of all homes for sale on St Croix over the 9 year period. 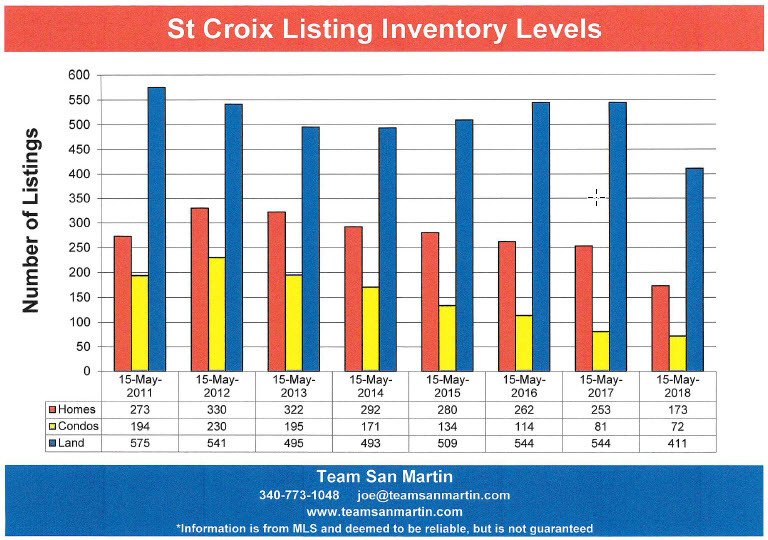 Nearly two thirds of all homes for sale on St Croix are currently listed for $400,000 or less. 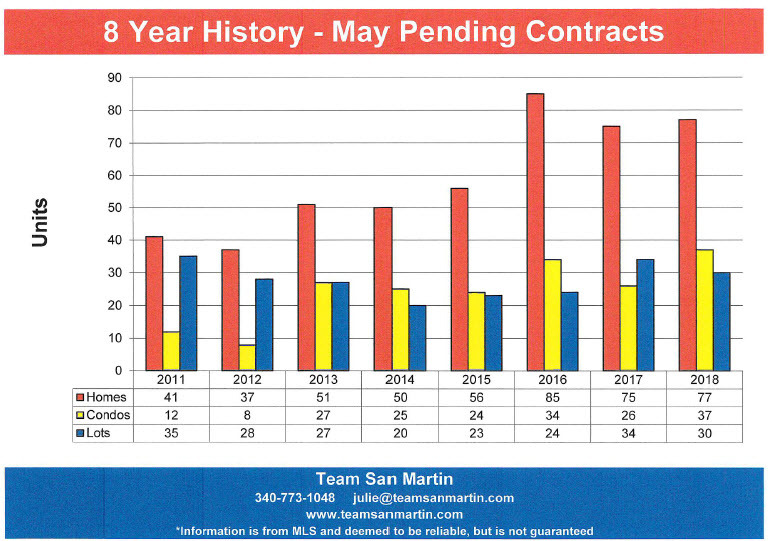 · Over the 9 year period, homes listed for more than $400,000 have decreased by 18%, from 56% of the inventory in 2010 to 38% of all homes for sale on St. Croix in May 2018. · The lowest price range (under $100,000) is now 12% and approaching the 2010 level of 9% of inventory, after more than tripling in 2014, when this price range represented 30% of condominium inventory. · The second tier ($100,000 to $200,000) has consistently included between one-third and one-half the inventory over the 9 year period. · Condominiums listed for more than $200,000 have consistently comprised about one third of the inventory over the 9 year period. · The lowest price range (under $50,000) has more than doubled over the 9 year period, from 20% of total inventory in 2010 to 42% of all lots for sale in 2018. · The second tier ($50,000 to $100,000) has decreased from one third of the inventory to one quarter of all lots for sale over the 9 year period. · Lots listed for more than $100,000 have decreased from approximately 45% of total inventory to about one third of all lots for sale over the 9 year period. Residential inventory peaked in 2012 at 330 homes for sale and has steadily declined since then. 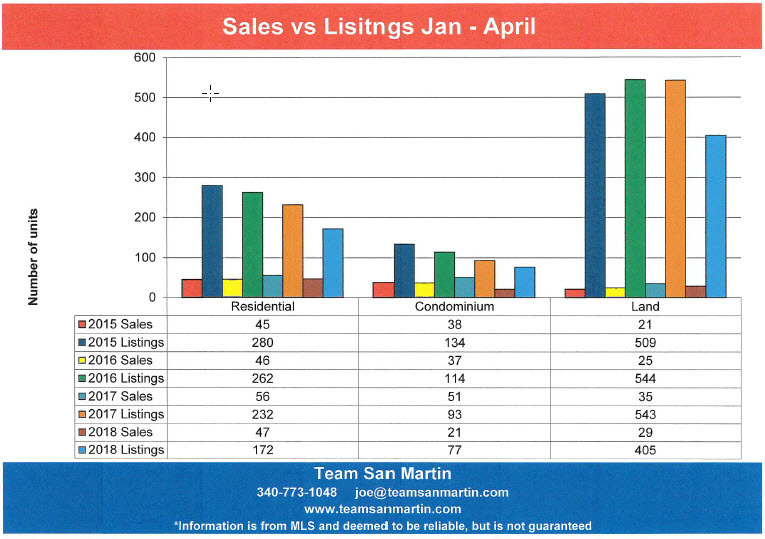 Current inventory of 173 homes for sale is 37% lower (100 homes) than May 2012 residential inventory. Condominium inventory also peaked in 2012, at 230 condominiums for sale, and has steadily declined since then. 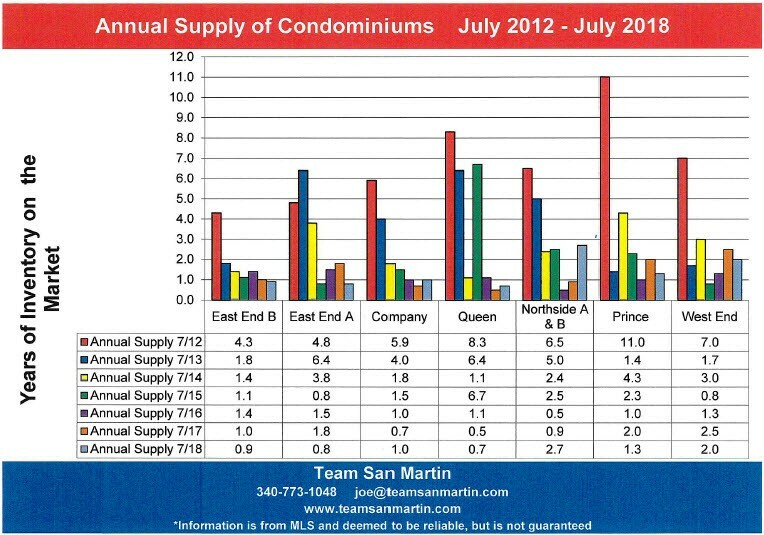 Current inventory of 72 condos is less than one third of the May 2012 condominium inventory. Land inventory peaked in 2011, steadily declining until 2014 and is now at its lowest level of the 8 year period with 411 lots for sale, nearly 30% lower than 8 years ago. Residential pending sales peaked in May 2016, at 85 pending residential sales, and have been robust since, at nearly twice the level of earlier in the decade. The condominium inventory has continuously declined since May 2012. Meanwhile the number of pending condo sales has steadily increased and is currently at 50% of the inventory! Pending land sales have remained relatively constant over the 8 year period, but now represent a higher portion of the inventory, which has significantly declined. Using the assumption that the first 4 months of 2018 is a valid predictor for the entire year. The first four months predict there will be approximately the same number of homes sold in 2018 as were sold during the previous 4 years. The average number of homes sold for years 2014 through 2017 was 154 homes annually; looks like a trend! The first four months predict there will be about half as many condominiums sold as were sold during the 2014 through 2017 period, which averaged 115 condos a year. 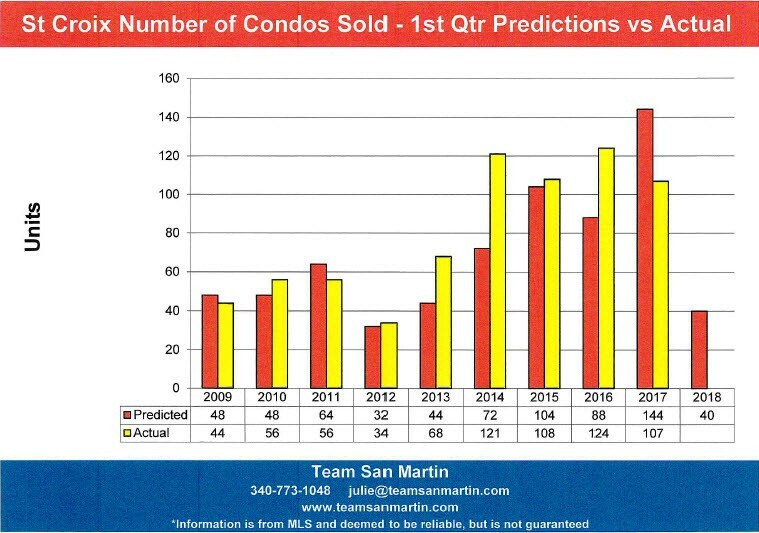 This prediction might be accurate, due to the low condominium inventory? Land sales have nearly returned to 2011 levels! 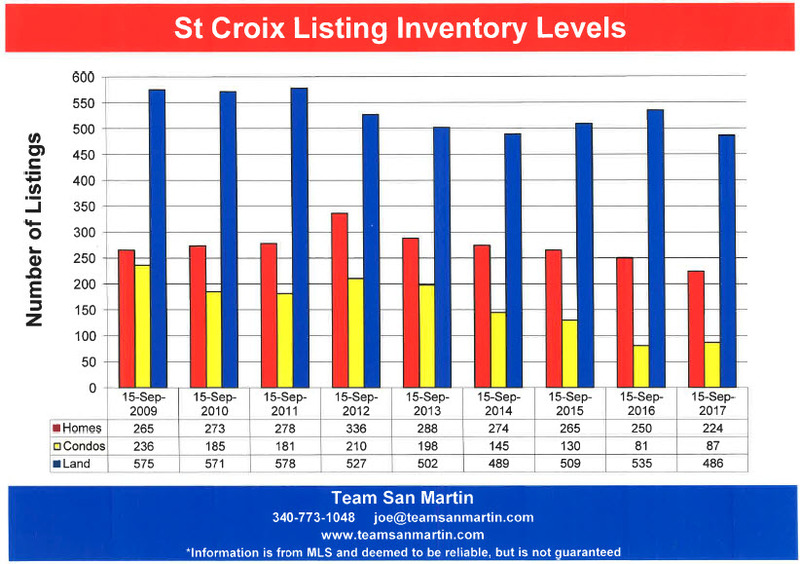 This is the segment of the St Croix real estate market showing the most improvement, but there is a lot of inventory to sell; the current rate of sales predicts about 20% of the inventory should sell during 2018. 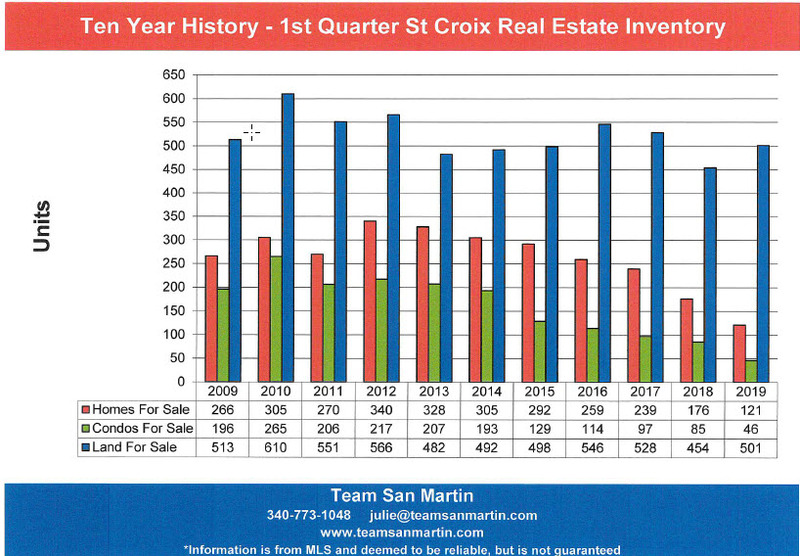 2018 is the 10th year of the St Croix real estate market “recovery” from the real estate boom years of 2006 through 2008. The two Category 5 hurricanes in September 2017 were not helpful. · Residential inventory peaked in 2012, at 340 homes for sale, and has continually declined each year since. Current residential inventory levels are at only 52% (176 homes) of the 2012 level, a significant decline. · Condominium inventory peaked in 2010, with 265 condominiums on the market. 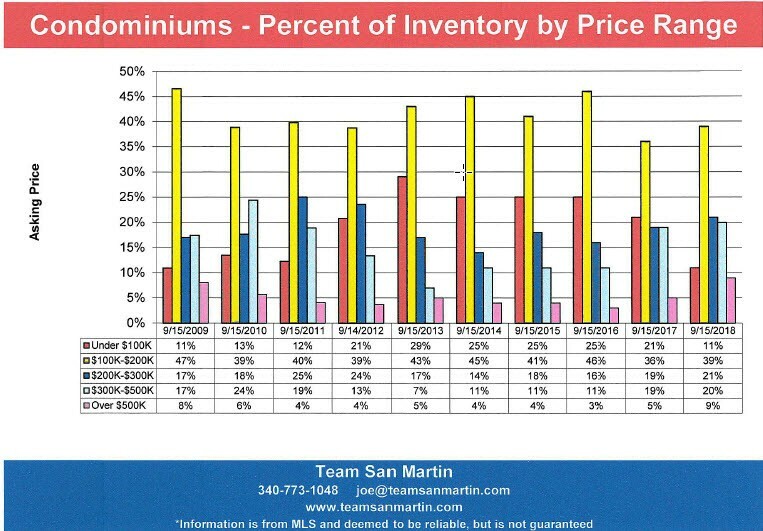 The current level of 85 condominiums for sale is only 32% of the inventory 2010. · Land inventory also peaked in 2010, at 610 lots for sale. First quarter 2018 inventory is again the lowest level of the 10 year period at 74% (454 lots) of the 2010 inventory levels. From 2009 to 2016, the number of homes sold during the first quarter consistently under predicted the total number of sales for the year. The average of the under prediction over the 8 year period was 20%. 2017 was a trend reverser; sales predictions based on the number of 1st quarter homes sold was 5% higher than the actual number of home sold. For the period 2012 through 2016, the average 1st quarter sales price was within 12% of the actual annual average sales price. The 2017 prediction, based on 1st quarter average home sales price, was 28% below the actual average 2017 home sales price of $402,507. · Total number of homes sold will be as predicted, around 120, representing about a 20% decreased from total number of homes sold during 2017. · Average sales price will most likely be in the $350,000 range, about the same as 2016. For the period of 2012 through 2016, the 1st quarter condo sales have underestimated the annual total number of condos sold by about 13%. 2017 was a game changer; the predicted number of condos sold (144) was 26% higher than the actual number of condos sold (107). · Total number of condominiums sold will be in the 80 condo range, even though only 10 condominiums sold during the 1st quarter. Put another way, all of the 85 condominiums currently listed for sale should sell. · Average sales price will most likely be in the $180,000 range, about 85% of the 1st quarter average 2018 condominium sales price. For the past 4 years, 2014 through 2017, the average lot sales price has consistently been in the $70,000 range. 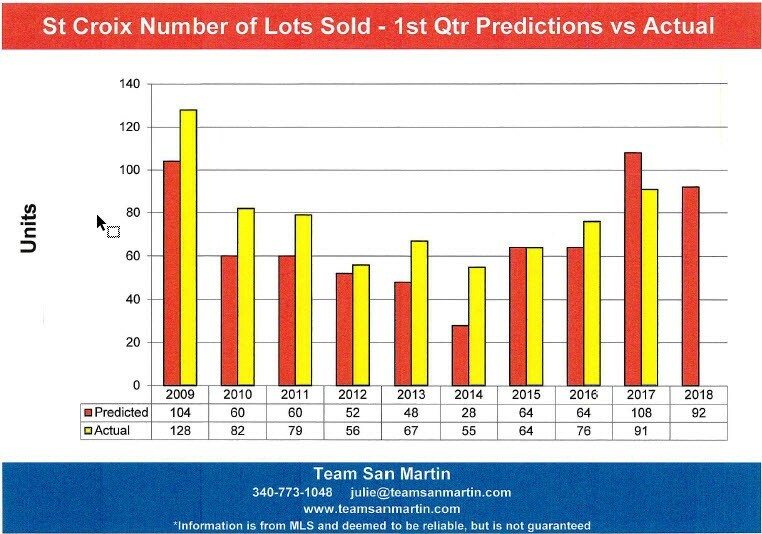 Predications based on 1st quarter land sales prices for this period varied as much as $30,000 off the actual annual lot sales price; this statistic does not appear to be a good predictor for the rest of the year. · Total number of lots sold will be about 100, similar to 2017 and the highest number of lots sold since 2009. 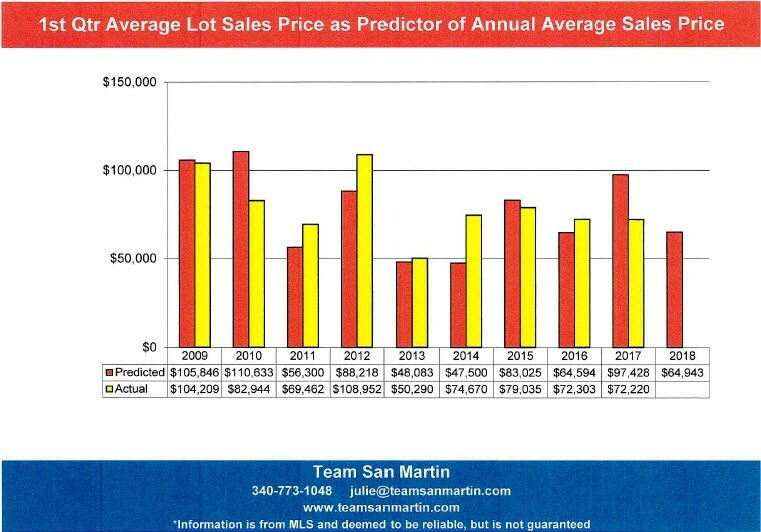 · The 2018 average lot sales price will be in the $70,000 range, similar to the previous 5 years. Land asking prices have adjusted downward. 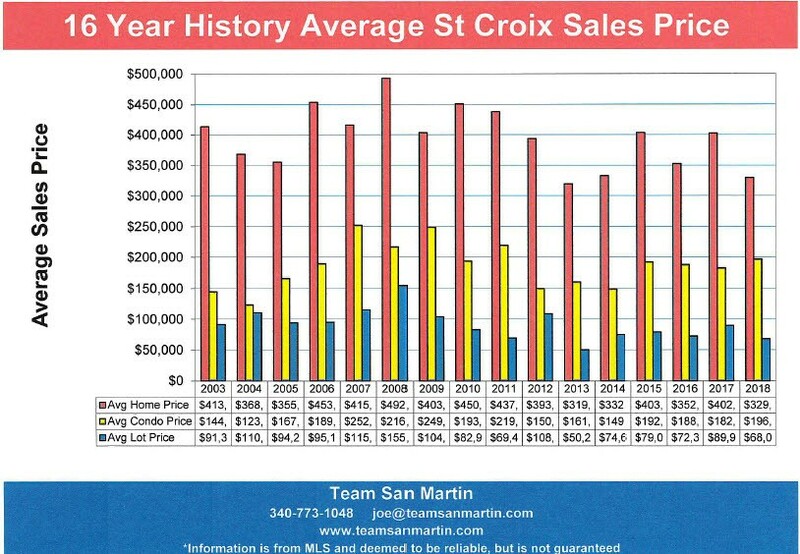 · Over the 15 year period, more homes sold every year on St Croix than on St Thomas. 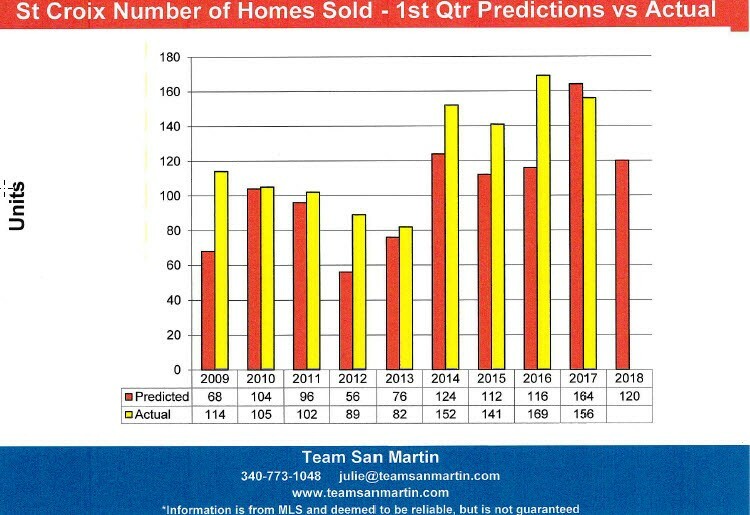 · The number of homes sold on both St Thomas and St Croix declined slightly in 2017, when compared to 2016; not surprising. 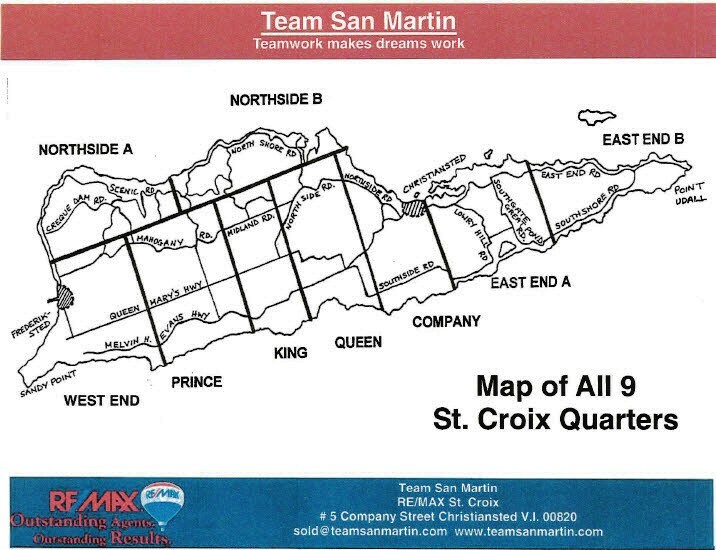 · Over the 15 year period, St Croix has seen a high of 188 homes sold (2006) and a low of 88 homes sold (2012). 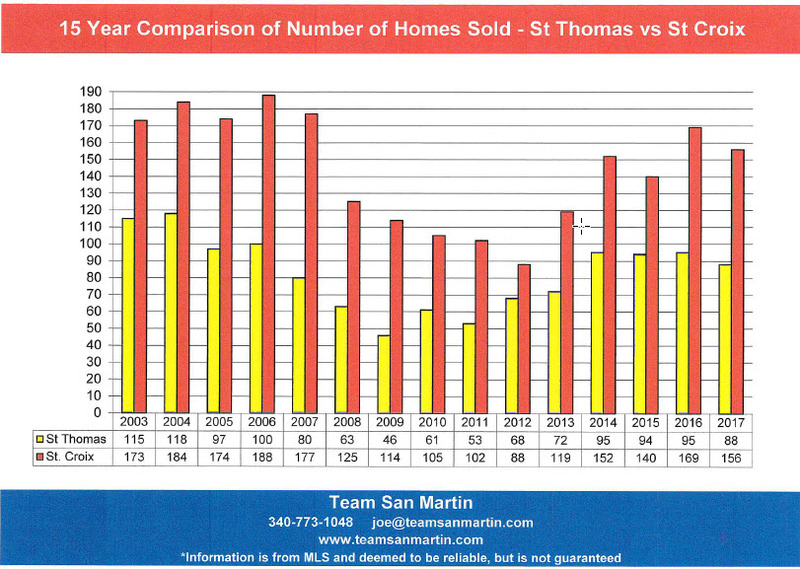 During this same period, St Thomas saw a high of 118 homes sold (2004) and a low of only 46 homes sold (2009). · Nearly twice as many homes were sold on St Croix during 2017 (156) as were sold on St Thomas (88). 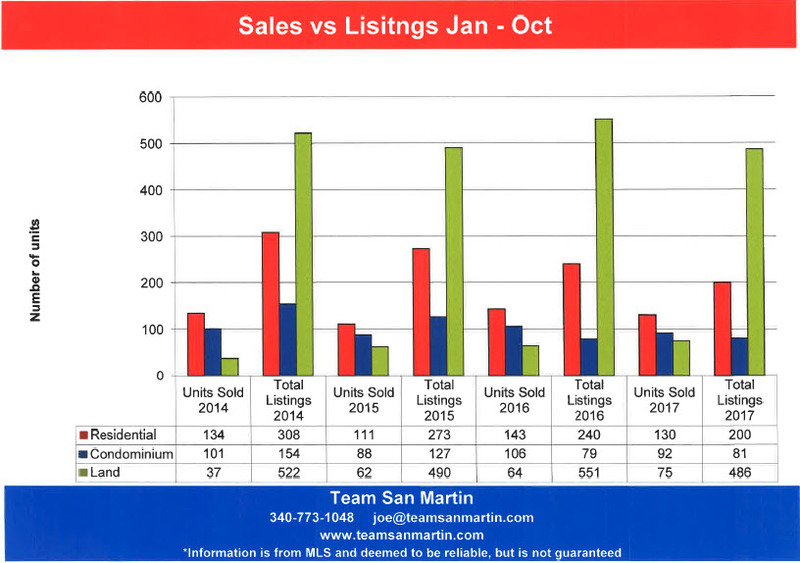 · Compared to 2016, 7 fewer homes were sold on St Thomas and 13 fewer homes were sold on St Croix during 2017. 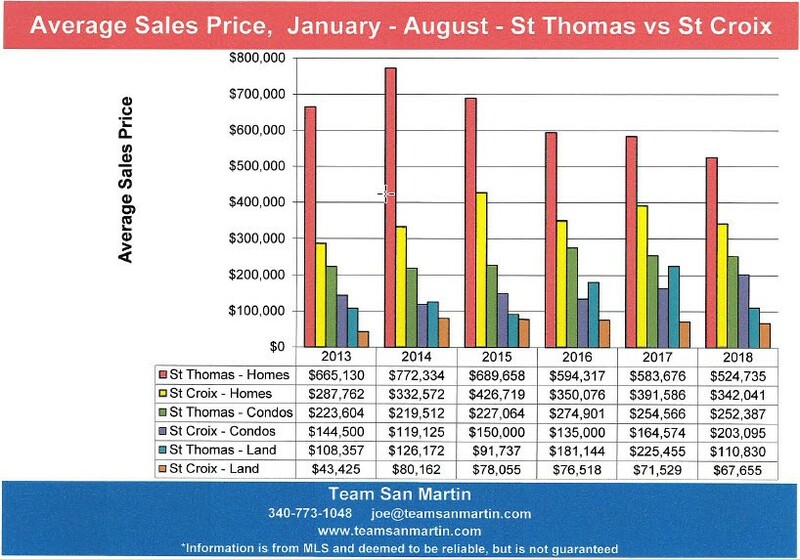 · At the beginning of this 15 year period (2003), average sales prices for St Thomas and St Croix were nearly identical, at an average of $415,823. 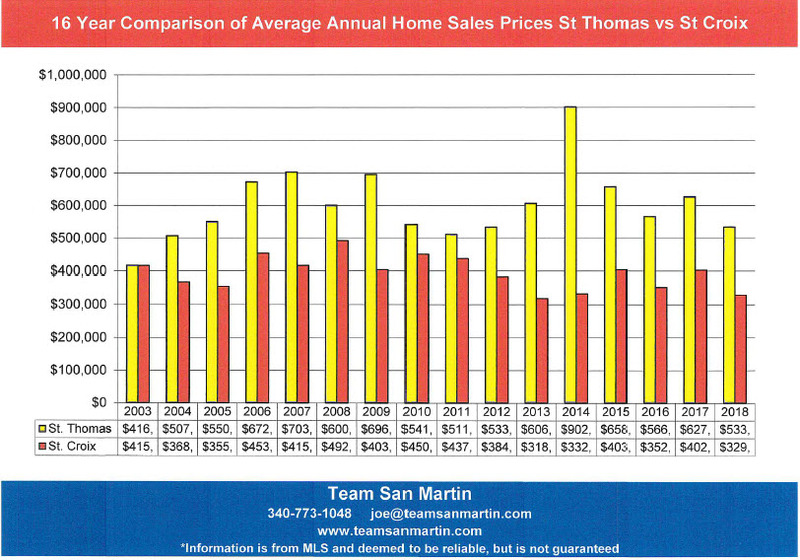 · From 2004 until the present (14 years) the annual average home sales price on St Thomas has exceeded that of St Croix. · For 2017, the average St Thomas homes price was 51% higher, at $627,079, than the 2003 average sales price. The average annual home sales price on St Croix for 2017 was 3% lower, at $402,507, than the 2003 average sales price. · The average sale price of a home on St Croix for 2017 ($402,507) was 64% of the averages sales price of a home on St Thomas ($627,079). 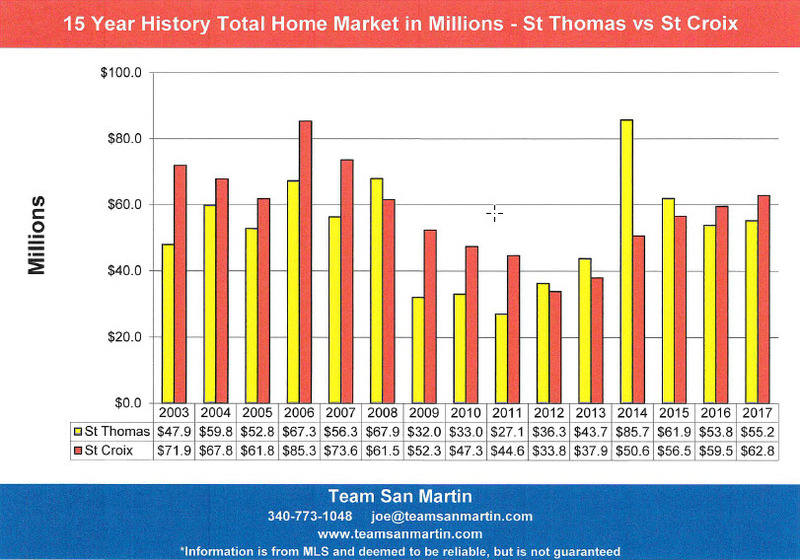 · During this 15 year period, the total St Thomas residential market exceeded the total St Croix market during four years: 2008, 2012, 2013, 2014, and 2015. For the past two years, 2016 and 2017, total St Croix residential market has exceeded the total St Thomas residential market by about $6 Million. 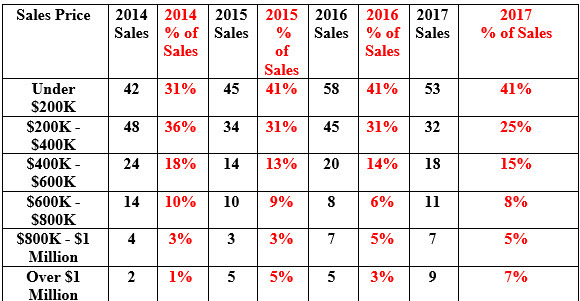 · Fewer homes and condominiums sold in 2017 than were sold in 2016; not a big surprise, given the two major 2017 hurricanes. There was, however, a slight uptick in number of lot sales – 12 more lots were sold in 2017 than in 2016. · The number of homes sold during 2017 (156) exceeds all years since 2008 (125 home sales) except 2016, when 169 homes sold. · The number of condominiums sold during 2017 (106) exceeds the number of sales for the seven year period of 2007 through 2013, but falls short of the previous three years sales numbers (2014 – 2016). · The number of lots sold during 2017 (88) exceeds all years since 2009, when 128 lots sold. · The 2017 average home sales price ($402,507) exceeded the average 2016 average homes sale price by $50,000! However, the 2017 average home sales price is $10,000 lower than the average home sale price of 15 years ago ($413,439). · The 2017 average condominium sales price ($182,412) is about $6,000 lower than the 2016 average condominium sales price. It is, however, nearly $40,000 higher than the average condominium sales price 15 years ago ($144,823). 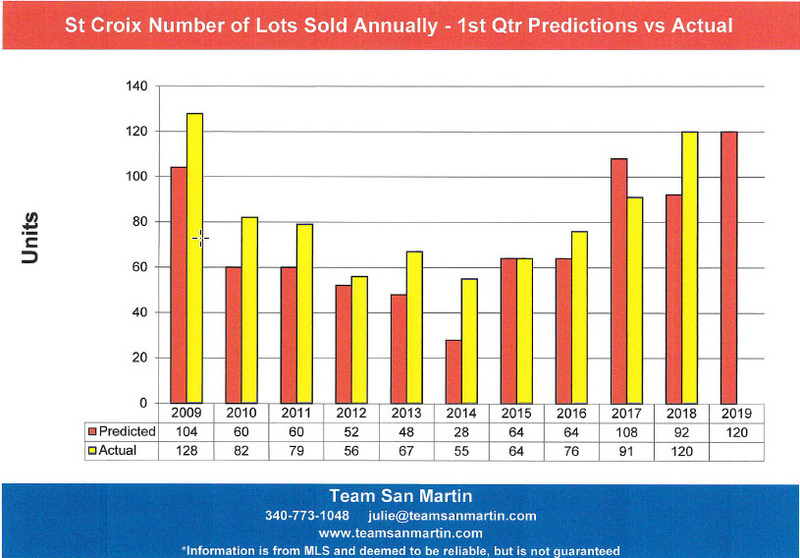 · The average 2017 lot sales price ($89,914) is the highest average lot sales price since 2012 ($108,952).The 2017 average lot sale price is nearly identical to the 2013 average lot sales price of $91,315. · The 2017 total residential market ($62.8 million) was about $3 million higher than the 2016 total residential market of $59.5 million. But the total residential market is still $9 million less than the total residential market of 15 years ago ($71.9 million). · The 2017 total condominium market ($17.7 million) was $5.6 Million lower than the total 2016 condominium market ($23.3 million). The 2017 total condominium market was also $2.6 million below the total condominium market in 2003 ($20.3 million). · The 2017 total land market ($6.5 million) exceed the previous year by $1 million. But the total land market is still more than $10 million below our total land market of 15 years ago ($17.1 million). Total number of homes sold increased 73% (65 homes) since 2012. Compared to 6 years ago, the average sales price of a home increased 1% ($4,208). 12 homes sold in 2012 compared to 28 in 2017. Compared to 6 years ago, the average sales price of a home decreased 59% ($505,672) from $859,500 for 2012 to $353,828 for 2017. 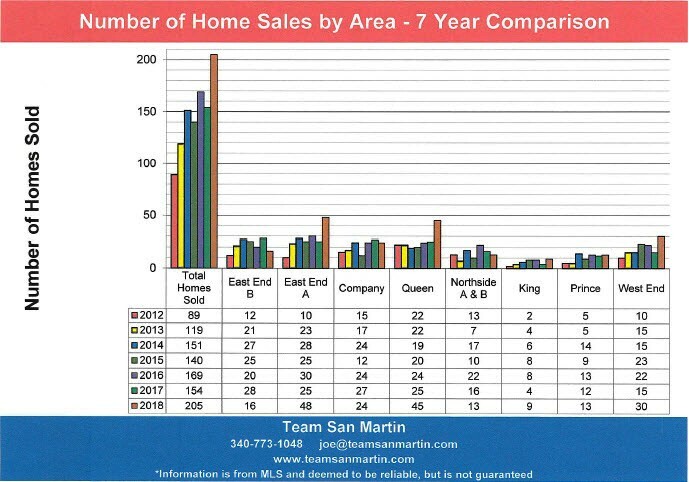 10 homes sold in 2012 compared to 25 in 2017. Compared to 6 years ago, the average sales price of a home increased 46% ($92,392), from $202,367 for 2012 to $294,759 for 2017.
from 15 home sales in 2012 to 27 homes sales in 2017. Compared to 6 years ago, the average sales price of a home increased 58% ($141,683) from $242,003 for 2012 to $383,686 for 2017. The number of homes sold in a year increased by 3 homes since 2012, from 22 homes sold in 2012 to 25 home sales in 2017. Compared to 6 years ago, the average sales price of a home increased 44% ($201,986), from $458,576 for 2012 to $660,562 for 2017. The number of homes sold in a year increased by 3 homes since 2012, from 13 homes sales in 2012 to 16 sold during 2017. Compared to 6 years ago, the average sales price of a home increased 69% ($65,250), from $94,750 for 2012 to $160,000 for 2017.
from 2 homes in 2012 to 4 homes in 2017. Compared to 6 years ago, the average sales price of a home decreased 15% ($37,392), from $256,000 for 2012 to $219,208 for 2017. Compared to 6 years ago, the average sales price of a home decreased 13% ($25,853), from $203,500 for 2012 to $177,647 for 2017. Five more homes sold during 2017 (15 homes) than during 2012 (10 homes). More homes sold in all quarters during 2017, when compared to 2012. Compared to 2016, the island wide average home sale price increased 15%. 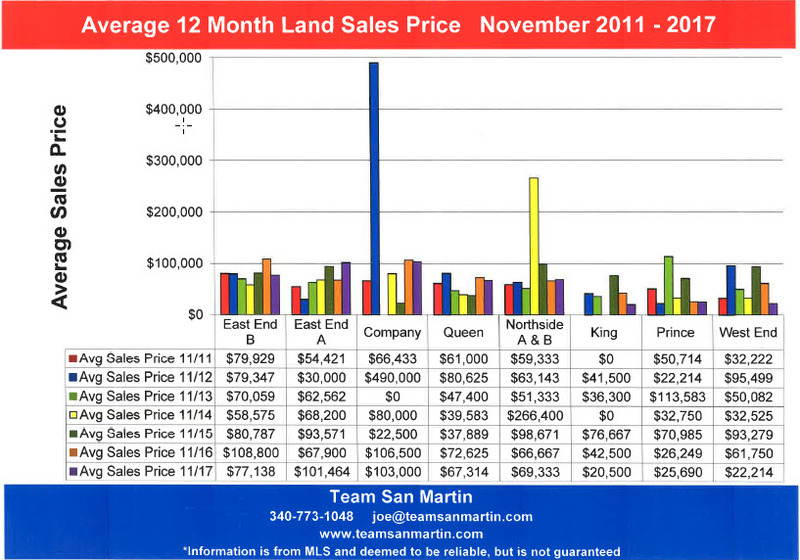 6 years ago, no land sales were reported in King Quarter during the 12 month period ending November 2011. 15% lower (41 homes) than eight years ago. GIGANTIC decrease over the eight year period! 16% lower (89 lots) than eight years ago. Under $200,000 listings have more than doubled (from 13% to 34%) as percentage of total inventory, compared to eight years ago. $200,000 to $400,000 listings have increased to 1/3 of the total inventory from about 28%, compared to eight years ago. $400,000 to $600,000 listings decreased by 3% of the total inventory over the eight year period. $600,000 to $800,000 listings have decreased from 15% to just 3% of total inventory over the eight year period. $800,000 to $1,000,000 have decreased by 50% over the eight year period, from 8% of total inventory on 9/15/09 to 4% on 9/15/17. Listings over $1,000,000 have decreased by 6% of the total inventory over the eight year period, from 20% on 9/15/09 to 14% on 9/15/17. Under $100,000 listings have nearly doubled (from 11% to 21%) as percentage of total inventory, compared to eight years ago. $100,000 to $200,000 listings have decreased by 11% of total inventory, to about 36%, compared to eight years ago. $200,000 to $300,000 listings have increased by 2% as percentage of total inventory, at about 19%, compared to eight years ago. $300,000 to $500,000 listings have also increased by about 2%, from 17% to 19%, compared to eight years ago. Listings over $500,000 have decreased by 3% of the total inventory over the eight year period, from 8% on 9/15/09 to 5% on 9/15/17. Under $50,000 listings have nearly doubled (from 21% to 44%) as percentage of total inventory, compared to eight years ago. $50,000 to $100,000 listings have decreased by 5% as percentage of total inventory, from 30% to 25%, compared to eight years ago. $100,000 to $300,000 listings have decreased by 11%, from 33% to 22%, compared to eight years ago. Listings over $300,000 have decreased by 7% of the total inventory over the eight year period, from 16% on 9/15/09 to 9% on 9/15/17. Very similar to the home market for both islands except the reduction in units sold during this period in 2015 was not as severe as experienced by the housing market. 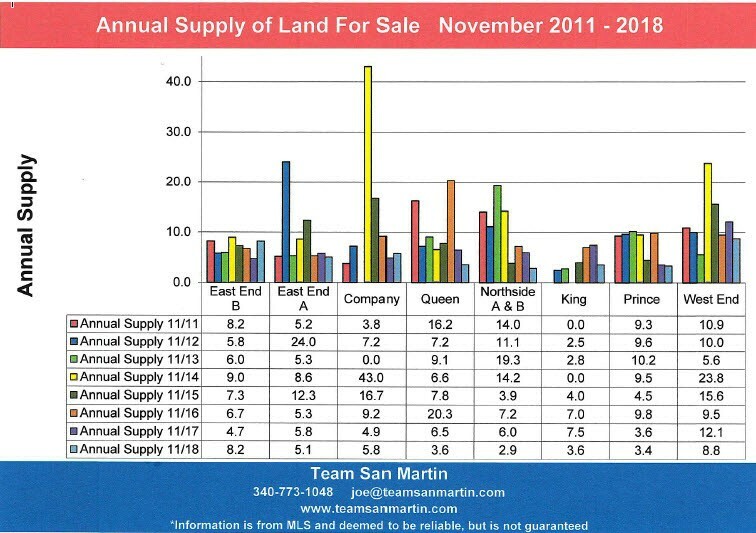 Vacant land is not selling well on either island. 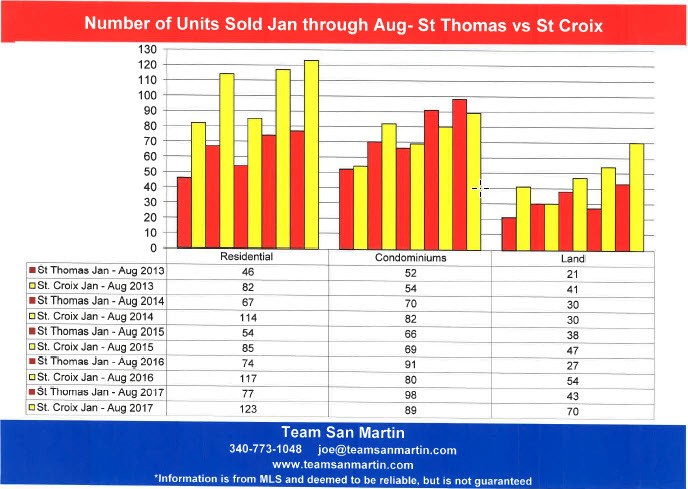 During this period in 2014, exactly the same number of lots were sold on both islands – this was a significant up tick for St Thomas and a big down tick for St Croix. 2017 saw a significant increase in lot sales on both islands. 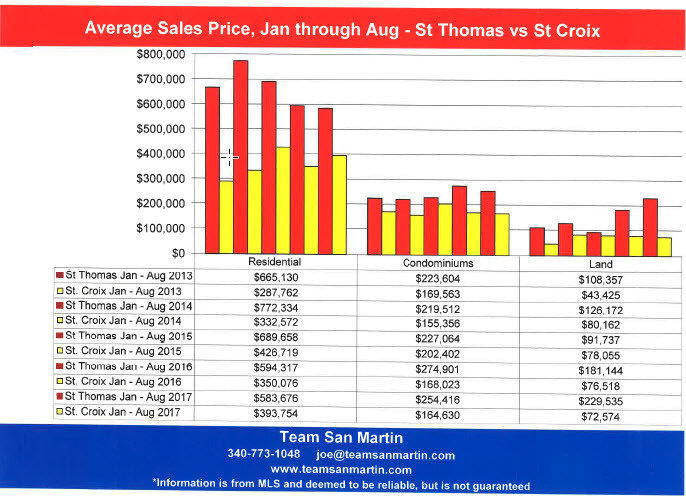 Comparatively, St Croix has performed better than St Thomas, but we still have a long way to go; the average home sale price on St Thomas is about 50% more than on St Croix. The median sales price is the midpoint - half of all homes sold for more than this price, half sold for less. 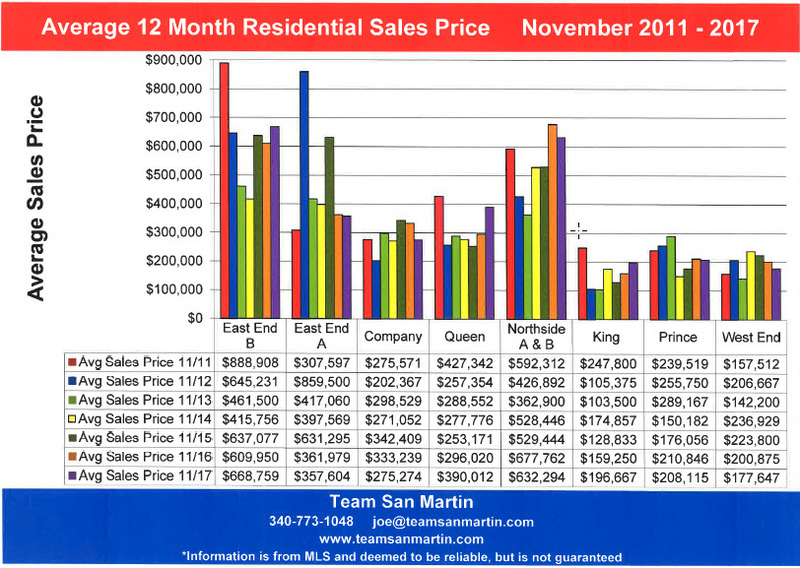 For St Thomas, the median sales price has decreased by $110,000 over the 5 year period. 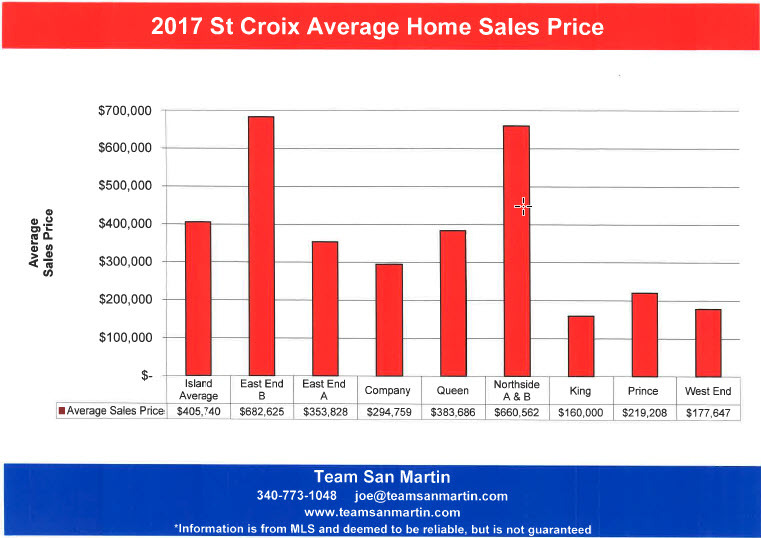 On St Croix, the median sales price is $10,000 higher than 5 years ago, but still only 70% of the St Thomas median sales price. 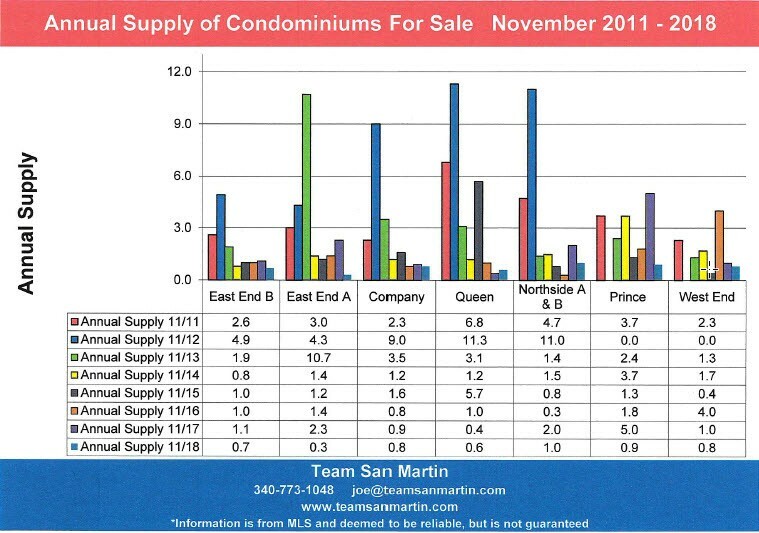 Average condominium sales price has increased by about $30,000 for St Thomas over the 5 year period. 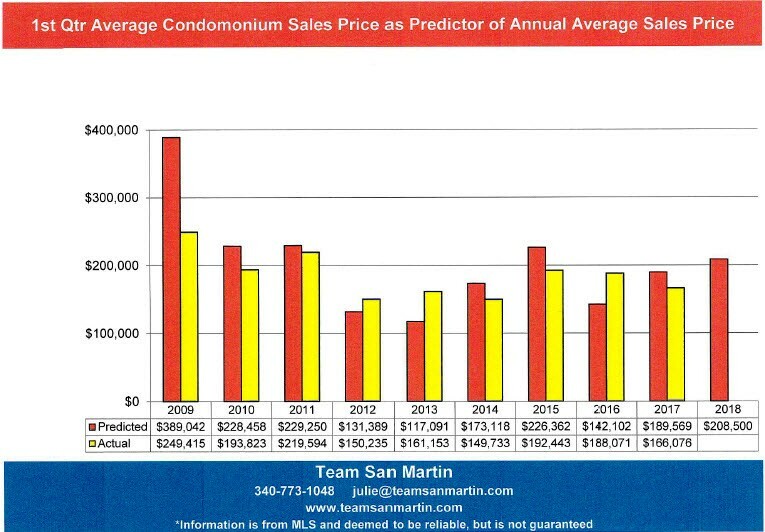 On St Croix, average condominium sales price has decreased by $5,000, compared to this period 5 years ago. 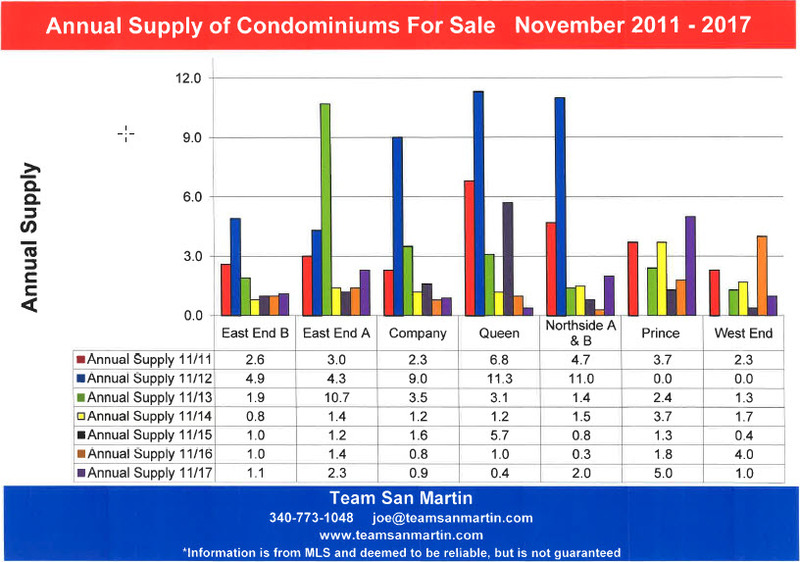 The median condominium sales price on St Thomas increased 24% over the 5 year period. St Croix showed no change, compared to 5 years ago. The median St Thomas sales price is $70,000 higher than St Croix. The worst performing segment of our real estate market has mirrored the home market with the exception that the average sale price is now nearly twice that of 5 years ago, for both islands. 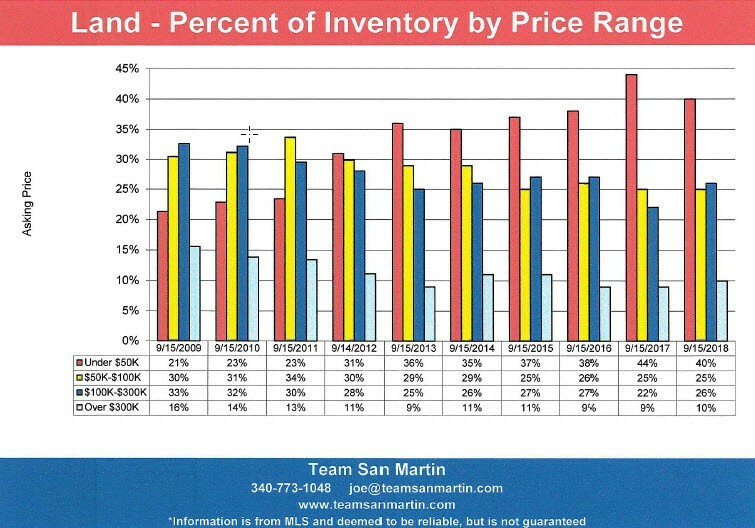 On both islands, the median lot sales price is almost exactly the same as 5 years ago. 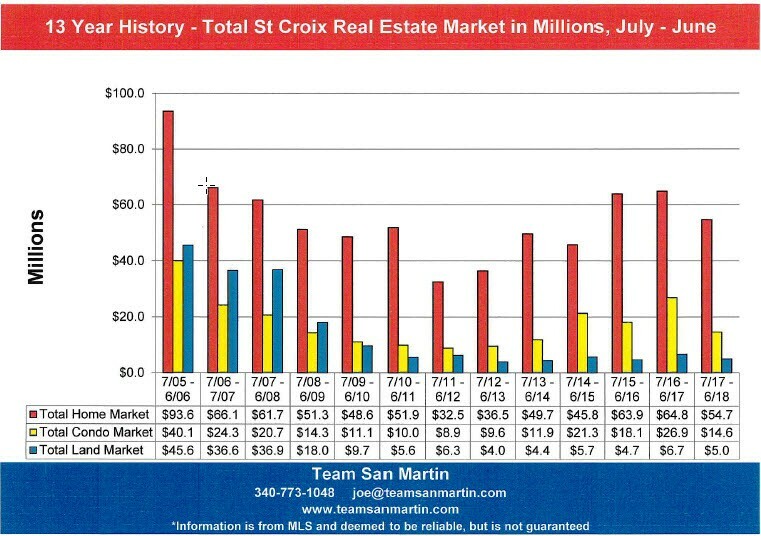 For the first time in this 5 year period, the St Croix total residential market exceeded that of St Thomas, by 1%. 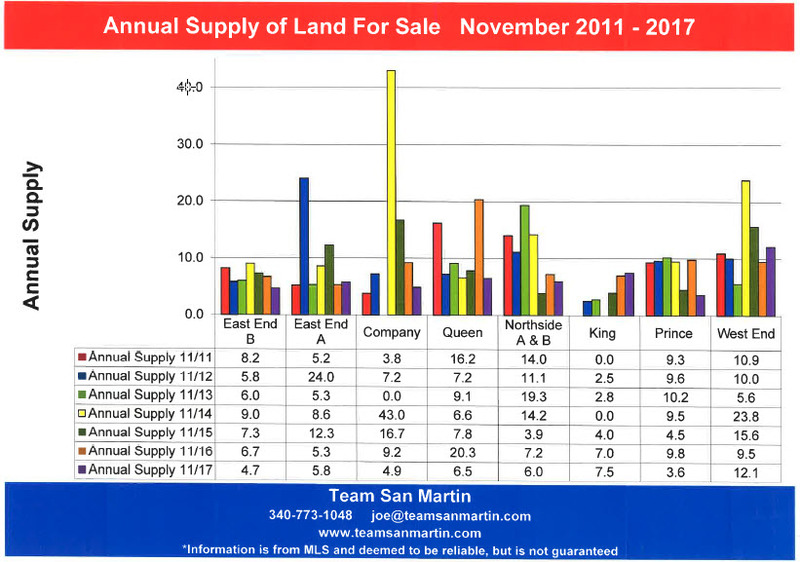 The St Thomas total land market quadrupled over the 5 year period and their total market is twice that of St Croix. 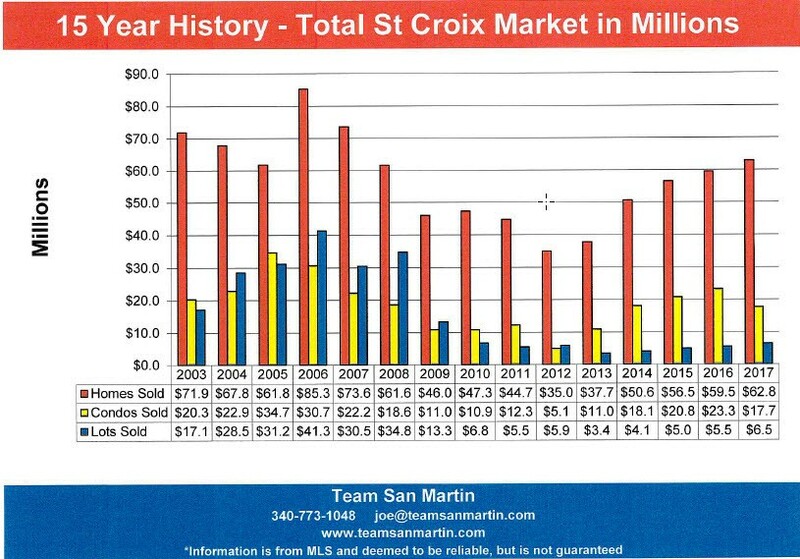 On St Croix the total market is about 2 ½ times that of 5 years ago for this period. Five years ago (July 2012), there was a 4.7 year supply of homes and a 4.3 year supply of condominiums on the market. For both homes and condominiums, the inventory has decreased by more than 3 years, to an 11 month supply of homes and a 1 year supply of condominiums. For homes, the average sales price has increased, compared to five years ago. Average home sale price increased by 5% over the five year period, from $575,667 for the 12 months ending July 2012 to $602,086 for the 12 months ending July 2017. Condominiums saw a significant average sale price decrease of 22% ($83,895), from $382,500 for the 12 months ending July 2012 to $298,605 for the 12 months ending July 2017. Five years ago (July 2012), there was a 4.2 year supply of homes and a 4.8 year supply of condominiums on the market. For both homes and condominiums, the inventory has decreased by about 3 years, to a 1.6 year supply of homes and a 1.8 year supply of condominiums. 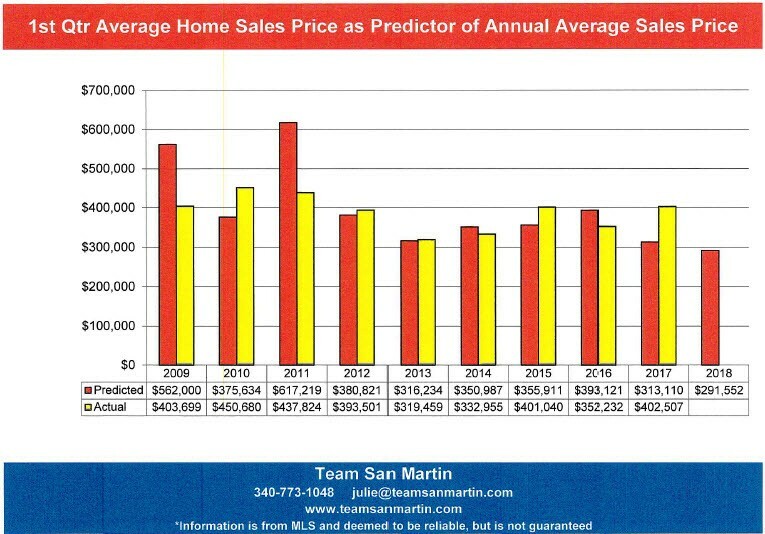 For homes, the average sales price decreased, compared to five years ago. For condominiums, the average sale price increased by about $4,000. Average home sale price decreased by 7% ($82,209) over the five year period, from $481,712 for the 12 months ending July 2012 to $399,503 for the 12 months ending July 2017. Condominiums saw a 2% increase in average sales price, from $204,667 for the 12 months ending July 2012 to $208,333 for the 12 months ending July 2017. Five years ago (July 2012), there was a 3.7 year supply of homes and a 5.9 year supply of condominiums on the market. For homes, the inventory decreased by nearly 3 years, to just a 1 year supply of homes. For condominiums, the inventory sell off was even more dramatic, from a 5.9 year supply of units to just 8 months! There were 52 condominium sales in Company Quarter in the past 12 months; extraordinary when you consider there are currently only 79 condominiums for sale on St Croix! For both homes and condominiums, the average sales price increased, compared to five years ago. Average home sale price increased 86% over the five year period, from $191,269 for the 12 months ending July 2012 to $356,306 for the 12 months ending July 2017. Condominiums saw a 43% increase in average sales price, from $106,250 for the 12 months ending July 2012 to $152,223 for the 12 months ending July 2017. 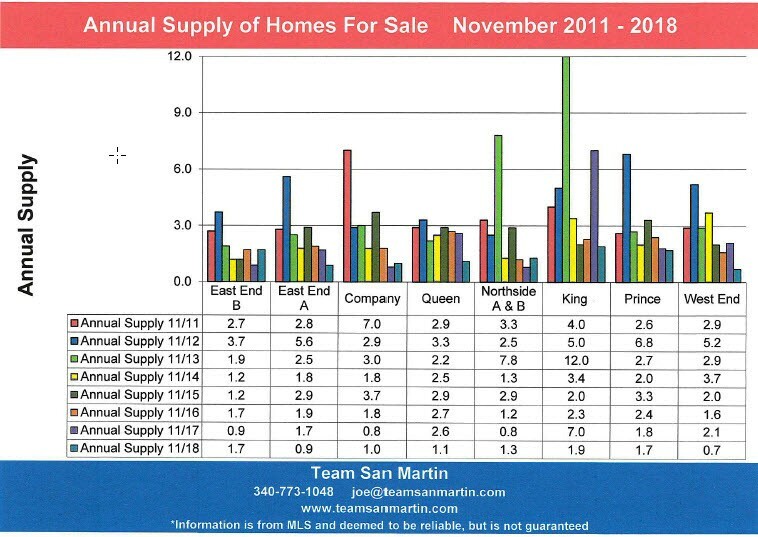 Five years ago (July 2012), there was a 3.1 year supply of homes and an 8.3 year supply of condominiums on the market. For homes, the inventory decreased only slightly, to a 2.6 year supply of homes. For condominiums, the supply decreased by nearly 8 years to a six month supply of condominiums. For homes, the average sales price decreased 16% ($38,118), compared to four years ago, from $291,289 to $253,171 for the 12 months ending July 2017. Condominiums not only saw a big decrease in inventory, the average sales price increased 48% ($36,140), from $75,125 for the 12 months ending July 2012 to $111,265 for the 12 months ending July 2017. Five years ago (July 2012), there was a 4.6 year supply of homes and a 6.5 year supply of condominiums on the market. For homes, the inventory decreased by more than 3 years, to a 1.4 year supply of homes. For condominiums, the supply decreased by nearly 6 years to an eleven month supply of condominiums. 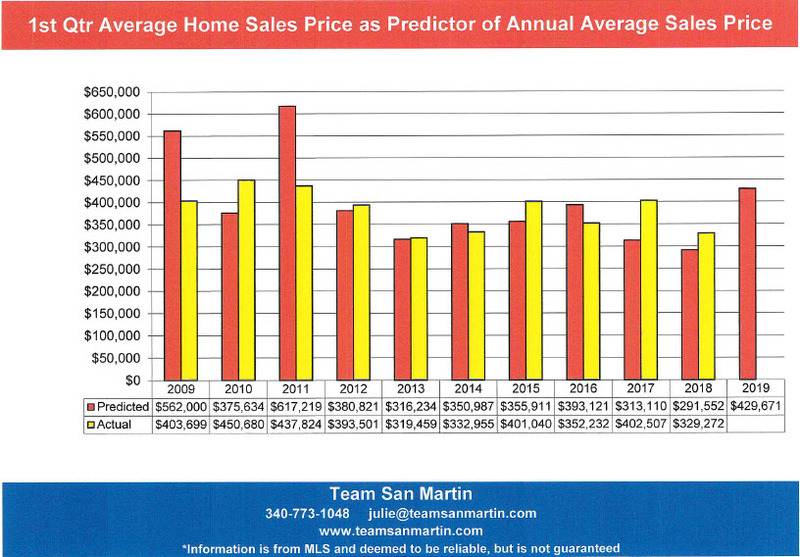 For homes, the average sales price increased, compared to five years ago. 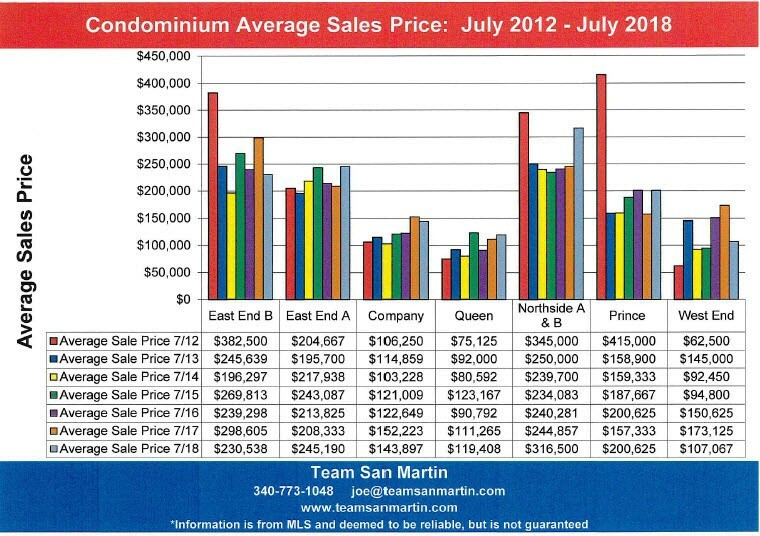 For condominiums, the average sales price decreased. Average home sale price increased 38% ($176,596) over the five year period, from $459,110 for the 12 months ending July 2012 to $635,706 for the 12 months ending July 2017. Condominiums saw a 29% decrease ($100,143) in average sales price, from $345,000 for the 12 months ending July 2012 to $244,857 for the 12 months ending July 2017. Home inventory increased to a 5 year supply of homes, compared to five years ago. 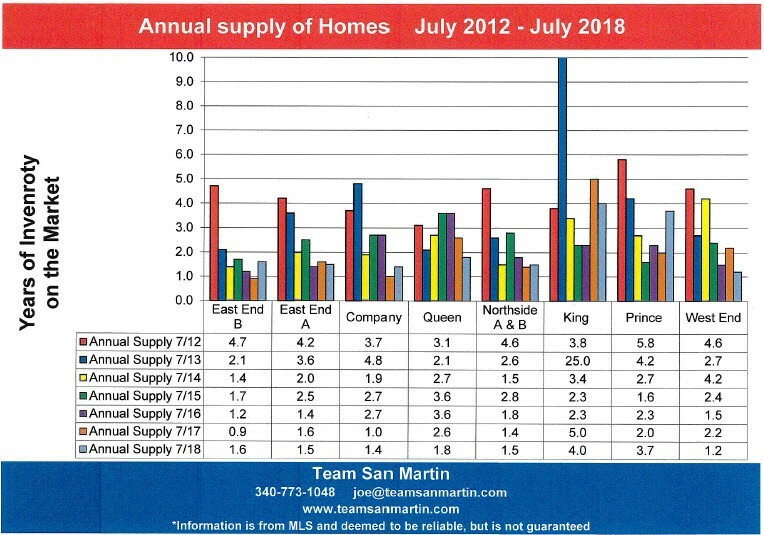 For the 12 months ending July 2013, only one home sold in King Quarter.